Beautiful cities, villages and hilltop towns are scattered throughout this amazing region drawing travelers from all over the globe to one of the most glorious and historic locations in all of Italy. But what has always drawn me to this region are the unpopulated places. Its seductive and mesmerizing countryside; the soft, rolling hills, lush vineyards; shimmering olive groves; and country roads lined with regal cypress trees – their elegant foliage piercing the Tuscan sky – is where I find the magic in this extraordinary (if no longer unknown) place. A symbiosis with the land runs deep in the Tuscan soul. Enjoying food at its seasonal peak when it has just popped out of the soil or ripened on the vine is a part of normal everyday life in all of Italy – especially in Tuscany where so many local ingredients inspire their own celebration. Fettunta, for instance, (the colloquial Tuscan word for bruschetta) takes place each November in celebration of the olive oil harvest. After the farmers have picked, pressed and processed the last of the olives, friends and family gather to taste the results. Luscious emerald green, herbal, peppery Tuscan olive oil – arguably the finest in the world – is drizzled on crusty pieces of grilled bread that have been rubbed with cloves of fresh raw garlic. With this simple act, the celebration and appreciation for olio nuovo (new oil) begins – an observance in recognition of all the care and hard work that went into producing such a glorious product. Embracing local, in-season ingredients is synonymous with “regional cuisine” in Italy. Farm-to-table, the buzzwords used today to indicate the use of locally sourced ingredients, is old hat there. What a home cook or chef was able to find locally and in-season was what was put on the table, and not because it was en vogue. Italians cooked this way because it is both cost effective and infinitely more delicious to use what your neighbors farmed, raised, or processed themselves. It only followed that those dishes took on a regional identity that continues to this day. It was in Tuscany that I was reminded of my own childhood connection to the land – a connection that had begun to fade in my memory at the time. Growing up, I too experienced farm-to-table, I just didn’t realize or appreciate it. I suppose it was actually more like “garden-to-table;” my father’s garden. He was not a farmer but his summer garden provided our family with an abbondanza of good things to eat. Actually, he was a teacher, coach and junior high school principal. Summer was his time off from educational duties and even though he had several summer jobs, he was somehow miraculously able to keep up with his very large and very lush garden. I grew up with my dad, mom and two sisters in a small town in Southeastern Wisconsin. Cold weather prevented the state’s population from enjoying local produce all year long, but summer was different. In my family, summer was a particularly exciting time. We had a “Farmer’s Market” right in our own backyard where our father grew everything from gooseberries, strawberries, rhubarb, raspberries and grapes to kohlrabi, lettuce, cucumbers, green beans, tomatoes and zucchini. My mother became his co-conspirator, especially at harvest time when our garden was overflowing with produce. Together they made grape jelly, raspberry and strawberry jam, rhubarb sauce and jar after jar of canned tomatoes. All were eventually stored in our basement pantry and enjoyed throughout the cold Wisconsin winter. When I look back on those years, I now understand that at the time I might not have consciously understood that a plump red raspberry would never taste as sweet as it did after plucking it from the raspberry bush the very minute it turned bright red. Or that picking zucchini when they were young and their seeds still soft and immature would make such a difference in their flavor and consistency. Or that my mother’s rhubarb pie baked in the late spring and early summer when the rhubarb had just sprung from the ground would taste so delectably tangy and so different from one baked off-season. But unconsciously that appreciation for fresh and local (and in the case of my father’s garden, very local), ingredients was something I would always value and would eventually put to use in my career as a restaurateur. But despite how important those lessons from my father’s garden were to what I do today at Convito, it is the small recollections that still resonate with me. I remember how much my sisters and I looked forward to our father’s homemade grape juice, especially before bedtime and especially when accompanied by heaping bowls of freshly popped popcorn. Then there was his rhubarb wine, and though I don’t think I was ever allowed to drink it, I’m fairly certain that my memories of the sour faces of my neighbors indicated that it was not one of his triumphs. But his zucchini pickles became legendary in our family. They were tangy, somewhat sweet and sour and unlike anything I have tasted since then. Convito even sold them in our market for a period of time. But adding the burden of canning to an already busy kitchen became too difficult. Please both in a bowl and cover with water. Add salt. Let stand 1 hour. Drain. Place vinegar, sugar, celery seed, mustard seed, turmeric and dry mustard in a saucepan. Bring to a boil over medium heat. Pour over zucchini and onions. Let stand for 1 hour. Put all back into a saucepan and bring to a boil. Simmer for 3 minutes. Pack in 3 hot sterilized pint jars and seal. Process 5 minutes in hot water bath. Note: Can be stored in refrigerator without processing for about 2 to 3 weeks. Another zucchini recipe I remember well was one I had at a Michelin-starred Tuscan restaurant called Arnolfo in Colle di Val d’Elsa with renowned winemaker Francesco Bonfio, owner of a boutique Chianti winery near Siena. The restaurant is housed in an elegant sixteenth century palazzo and we sat on a spectacular terrace overlooking the Tuscan hillside enjoying the glorious summer breezes and one of the most impressive multi-coursed degustazione lunches I have ever had. Each course was a work of art and just as delicious as it was beautiful – so much so that my son, Rob and I sketched every dish in my journal. The dish I remembered so well was basically paper-thin raw sliced zucchini placed in a circular pattern on top of paper-thin slices of delicious beef carpaccio. The dish was finished with a fine dice of fresh tomato in the center then drizzled with Tuscan Extra Virgin Olive. Arnolfo is known for its inventive but unfussy cuisine using local Tuscan ingredients and this was a perfect example. Francesco Bonfio had visited Convito several times in the early eighties and now it was my turn to visit him. After lunch he took us to his wine bar in Siena just off the famous Piazza del Campo. He wanted us to see the elaborate preparations being made for the upcoming medieval horse race, the Palio, famous throughout Italy and much of the world. The race takes place in the Piazza del Campo. The competition is between the 17 contrada of the town. As Francesco explained, contradas are districts within Italian cities. Each contrada is represented by a different symbol. Most are animals but some are mythical creatures taken from nature. In Francesco’s contrada, Onda (translated as wave), dolphin lanterns lined the narrow streets. The dolphin is the Onda’s symbol, its colors are white and blue representing the colors of heaven and the sea. The impending race would take place just a week after our visit, but extensive preparations were already underway. We were sorry to miss it, but as Francesco warned it is an absolute mad house and very difficult to get close enough to see the actual race anyway. Regardless, we were at least happy to have seen the preparations and feel the excitement in the air, though I strongly suspect my son would have preferred to experience the real thing! After a tour of Siena we drove to Francesco’s vineyard – Il Poggiolo. We met Federico, Francesco’s father then walked together through the lush green vineyard to their home for a tasting of the winery’s most recent releases. The Il Poggiolo’s Chianti we tasted that afternoon was light in style, very fragrant and brimming with berries. We continued to enjoy the rich assortment of summer fruits and vegetables for the remainder of our trip. My family and I were staying at Il Pellicano, a lovely rustically chic resort near Porto Ercole right on the Tyrrhenian Sea. This particular section of the Tuscan coast was very rocky and dramatic revealing yet another dimension of Tuscany’s lyrical landscape. The drama was especially apparent when we took the resort’s cliff elevator down to the sea where the steep rocky cliffs provided a refuge from the world. The fierce wind off the sea tricked you into thinking the sun wouldn’t burn. “Be careful,” I warned my kids. “Don’t stay too long or you’ll be sorry!” Of course, as all mothers are by their teenage kids, I was ignored! The resort had several restaurants. We preferred the more casual grill or the outdoor terrace where we spent many lunches and dinners taking pleasure in the restaurant’s seasonal local ingredients; fish from the sea, vegetables and fruits from the land and delicious organic meats. As anyone who reads this blog already knows, I can never get enough of tomatoes in season. I order them at every opportunity, in salads, sauces or just plain drizzled with peppery Tuscan olive oil. For me they are the embodiment of Italian cuisine. Despite my experience with my father and his bountiful garden, fresh produce and buying from local farmers was not a priority in America when I was growing up, particularly not in the restaurant business. You could almost always buy and savor a juicy tomato from a farm stand or pluck it from your garden, but enjoying it in a restaurant was not at all a given. Today with the burgeoning of local farmer’s-markets and the vocal proponents of locally grown produce like Alice Waters (owner of the famous restaurant Chez Panisse in Berkeley California), it is finally becoming a part of the American culinary philosophy. Alice advocates that cooking should be based on the finest and freshest ingredients that are produced sustainably and locally. That was always apparent to me in any good Tuscan restaurant. But now thanks to the passion of Alice Waters and others like her, it has become apparent in restaurants across America. The best restaurants in this country (and I count Convito as a very early adopter of this philosophy) now take pride in the relationships they form with local growers and suppliers. And those relationships do make a difference in what you find on your plate. A restaurant without the flexibility to adapt to what is fresh and in-season is one whose food will perhaps be consistent in what they offer, but not necessarily in quality and creativity. Convito has always tried to present a menu that has a consistent roster of dishes that we know we can make no matter what the season or local availability, but to also offer cuisine that can react to change. To me that is the mark of a successful restaurant: one that can both feel familiar to its clientele, but also fresh, current and occasionally challenging. I know for a fact that over the years I have lost customers because we didn’t have something that they had grown to expect every time they came to the restaurant. But if we can’t get the right ingredients (fresh, local affordable) to make it the right way (delicious! ), then I don’t believe we should serve it. Most people understand and even appreciate this philosophy, but not everyone has the same priorities we do. To those rare customers who’ve left us for our “transgressions” I implore you to come back and try us again with this concept in mind! I had previously visited this part of the Tuscan coast in 1982 with my partner, Paolo Volpara. That particular visit however took place on a dreary, rainy day in late February, very unlike the glorious weather we experienced in the summer of 1989 when I was there with my family. Paolo’s and my destination was further north in Viareggio, also a dramatically beautiful seaside resort, but one that boasted more traditional beaches than the rocky cliffs of Porto Ercole. Besides those beaches, Viareggio is also famous for its carnivale celebration which had just taken place two days before we arrived. It is celebrated with a parade of giant papier-mâché floats many of which were still resting on the promenade near the sea, waiting to be dismantled and reminding me of Maurice Sendak’s “Wild Things” after Max has sailed back to his bedroom. To avoid the rain we ducked into a cozy little restaurant on the outskirts of town. Since we were so close to the sea, the menu was naturally focused on fish, but I was in a different mood and decided to throw caution to the wind and order a sautéed pork chop topped with a seasonal blood orange relish. Meat rather than fish somehow seemed to match my mood on this dark winter day. It was delicious. But what really caught my attention was the cannellini bean and potato accompaniment to the pork chop. I had tasted similar side dishes at several other Tuscan restaurants, one of which was in the Grill Room at Il Pellicano where I would dine years later with my family. There it was served with the famous Bistecca alla Fiorentina, a steak made from the region’s Chianina breed of cattle known for both tenderness and flavor. The citizens of Tuscany are often referred to as mangia-fagioli (“bean eaters”) because so many of the region’s traditional dishes are built around beans. If that is what defines a Tuscan, I suppose I am also a Tuscan in (at least spirit) and am appropriately drawn to any dish on the menu that lists beans as an ingredient. Because most beans are dried before they are cooked, seasonality doesn’t really enter the equation when serving them, so they are always on the menu and can be savored during any time of the year; in summer with a grilled steak, in winter with a pork chop, in fall as the starch in a fish stew, or any time as the main ingredient in pretty much any soup you can dream up! I am a big fan of their taste, texture, versatility and endurance. I was determined to recreate this recipe. After much experimentation, one summer evening back in Chicago I had a small dinner party and served it (along with a grilled steak) to famed food writer and journalist Bill Rice and his wife Jill Van Cleave (culinary consultant and recipe developer, and now a dear friend). Of course I was nervous with two such culinary luminaries at my table, but at the end of the meal when Bill asked me for the bean and potato recipe I knew I had nailed it. Whew! The recipe was eventually included in his Steak Lover’s Cookbook. A real honor! Heat 2 tablespoons of the oil, the butter and garlic in a large, heavy skillet – preferably cast iron – over medium-low heat until the garlic just begins to turn golden, about 2 minutes. Pat the potatoes dry again and add them to the skillet. Sauté until the potatoes are golden brown on all sides and cooked through, about 20 minutes, stirring and shaking the pan from time to time to turn them. Transfer the potatoes and any garlic that clings to them to the prepared baking pan and set aside. Add the beans (rinsed and drained if canned), broth, sage, salt, pepper and potato cubes to the skillet and cook over medium heat until hot, stirring to evenly distribute the ingredients. Serve hot. My favorite season in Tuscany is the fall. Beginning in late September, harvest time is when all the tastes of autumn arrive; mushrooms, chestnuts, olives, wine – in other words all the best stuff! Visiting a vineyard during this time when everyone from the pickers to the vintners are involved in the most crucial step in the winemaking process – the actual picking of the grapes – is astonishing. It is an extremely important, dramatic and taxing time for any winemaker and to watch it happen in close proximity allows one a revelatory perspective. It is certainly stressful – but in a different way. As winemaker Francesco Bonfio said – “what has happened has happened”. But even so, there are other priorities and other deadlines to make adding a pressure of another sort. I was able to feel much of that harvest excitement during another trip I took in the autumn of 2000 with my daughter, Candace, her husband, Rob and good friend, Nancy Harris. We visited three different vineyards: Cappezana in Carmignano (described in blog Tuscany II “An Artist’s Palate”); Terrabianca in the hills of Radda in Chianti; and Monsanto in Poggibonsi. All estates were involved in some way in the harvesting of their grapes when we were there. Though it would be impossible for me to visit the estate of every wine we sell at Convito, I have made it a mission over the years to visit as many as possible, and to this day those that have impressed me the most are the ones we feature in our store. After a winery visit I invariably come away with a deeper understanding of philosophy, the creative perspective, the passion, the hard work and the care that went into growing a particular grape, and in so doing gain an appreciation for how a vintner will change that grape into a wine with a character and history I can then recognize and comprehend. The same goes for olive oil and in some ways a lot of other products – like amaretti biscotti made by the famous Lazzaroni family. I wanted Candace, my daughter – and now Convito partner – to experience that same thing – that deep appreciation that makes the selling of wine or olive oil or biscotti so much more meaningful. So a trip where we had the good fortune to visit three different outstanding wineries was especially memorable. Since our home base was located smack dab in the middle of the Chianti Hills close to the town of Castellina in Chianti, we became very familiar with the winding roads, the woods and the mesmerizing Tuscan countryside as we navigated through them each day to whatever charming Tuscan village or vineyard visit was next on our packed agenda. Everything about the estate from the labels to the tasting room reflected the very stylish, chic taste of the Guldener family. I especially loved the simplicity and class of their wine labels. The red seal in authentic red lacquer, which takes the place of a label on some of their wines, is the height of good taste matching the lovely wine in the bottle. After a tour, Roberto conducted a tasting of some of his wines in the upstairs tasting room. Most memorable was the Terrabianca Campaccio – unbelievably rich and complex. A blend of Sangiovese and Cabernet Sauvignon, it was according to Roberto, the wine most representative of his estate. “It was created to express the Terrabianca philosophy – a taste of Tuscany and a taste of the world today,” Guldener explained proudly. I couldn’t have agreed more. After driving away from Terrabianca, Candace, Nancy and I were almost immediately lost. I like to blame the spirited conversation that rehashed our experience with Roberto and his winery, the dust clouds that we couldn’t avoid, and (perhaps) even the wine, but whatever the reason it worked in our favor. One of the bonuses of getting lost in the Chianti Hills was the discovery of little gems you would never find if you tried to plan it. This time it came in the form of a little restaurant that we serendipitously stumbled across near the charming hilltop town of Panzano called Osteria la Piazza. The outside terrace overlooking the vine-clad hills of the area, was delightful. Sitting under earth-toned umbrellas we not only enjoyed the beginnings of a crisp autumn season, but delicious early autumn food as well. I so loved their farro mushroom soup, that we actually returned a second time at the very end of our trip to taste (and perhaps take some notes!) it again. The earthy taste of the mushrooms combined with farro was especially significant since we were in Tuscany, the region that helped to revive farro’s use. Sometimes confused as a pasta, farro is actually an ancient grain that was used for thousands of years in North Africa and the Middle East and was brought from there to the Roman Empire. Farro is not spelt or barley, nor is it a wheat berry. It is complex and nutty and lacks the usual heaviness of whole-wheat grains and is to me the perfect soup ingredient. Heat the oil in a heavy bottomed Dutch oven over medium-high heat. Sauté onions, carrots, leeks and pancetta for approximately 10 minutes until tender, stirring occasionally. Add garlic, sauté for 30 seconds then add mushrooms and sauté 5 – 7 minutes until the mushrooms have released some of their liquid. Add the thyme and wine and deglaze the pan. Add the farro and the beef broth. Bring to a boil, lower heat and simmer for 35-40 minutes. Taste for salt and pepper. Discard thyme. Getting lost seemed to be predictable whenever we made our way to a scheduled winery appointment in the Chianti Hills. Castello di Monsanto was no exception. I had long looked forward to visiting this estate – ever since I first savored a glass of their Chianti Riserva. It was like savoring all that is elegant and magnificently complex about Tuscany. It is, as one reviewer described, “a regal expression of Sangiovese,” the grape most closely identified with the region. But it was the winery’s label that actually caught my attention before I even tasted the wine. The label in itself is regal – a soft hued painting of the estate’s sienna colored stone buildings overlooking undulating vineyards set against a crisp blue cumulus clouded sky. To me this seemed to capture the very essence of Tuscany. Laura Bianchi – winemaker and ambassador of Castello di Monsanto – met us as we entered through the handsome gates of the estate. She is the daughter of the estate’s innovative winemaker, Fabrizio Bianchi. She now works side by side with her father and though biased, regards him as a “a genius winemaker,” a description which at the time seemed perhaps dismissible given her relationship with the man, but one that – after I met him – I would later whole-heartedly agree with. We first toured the impressive state-of-the-art winery and then – the real treat – were led into an unreal cellar that houses alcove after alcove of Monsanto vintages and special wines bottled and labeled for noteworthy occasions like “Laura’s wedding” or the birth of her children. Each alcove – some with iron gates – was beautifully lit creating a magical space. After walking through a lovely salon where we signed the guest book (I was excited to see Andrea Bocelli’s name several pages prior!) and a stroll around the enclosed Renaissance-inspired gardens, we made our way to a small intimate room for lunch. Along the way, we met Chuck, their whitish blond dog – only 6 months old. He seemed like an old member of the family who proudly escorted us to our table. We would be reminded of Chuck throughout our visit by the tufts of blond hair he deposited on all of his favorite resting places, many of which were in the room where we dined. Like everything else about this lovely estate, the room – dripping with antiques and other curiosities – emanated a romantic Tuscan atmosphere. Even the bathroom, where bunches of dried purple heather and goldenrod had been artistically arranged in an antique basket just to the side of the sink, was remarkable. How lovely, I thought and proceeded to sketch it in my journal. A possible ornamentation idea for me? Hmm…somehow repeating this atmosphere anywhere else might prove impossible to recreate. I never even tried. Lunch began with a glass of Monsanto Chianti Riserva served with fresh porcini mushrooms simply dressed with Tuscan olive oil and freshly chopped parsley. Again – the taste of autumn! Before our next course Laura announced that her family loved fried foods, “so be prepared!” And so we were. What followed was an impressive parade of fried foods – rabbit, zucchini, eggplant, potatoes and even bread. How did she stay so thin I wondered? The batter, however, was a tempura-like batter – light and delicious. We ended with a divine green lettuce salad simply dressed with the ubiquitous Tuscan olive oil and red wine vinegar, a combination that never failed to enhance anything it touched. The accompanying wine was Monsanto’s Nemo – a great Tuscan Cabernet. As one critic wrote, “To say that this wine tastes like Cabernet doesn’t do it justice. The bottle is Tuscan through and through and if you haven’t experienced it first hand, you’re doing yourself an injustice”. And here we were, tasting it first hand along side one of the winemakers sitting right across the table from us. I had to pinch myself. Laura is a warm, talented woman – a former lawyer, athlete (five sports – including running – account for her svelte figure in spite of her love of fried foods) and mother of 2. She loves to sing the praises of her mentor father, the great Fabrizio Bianchi who we met at the end of the meal. Through him we learned more about the history of the estate. 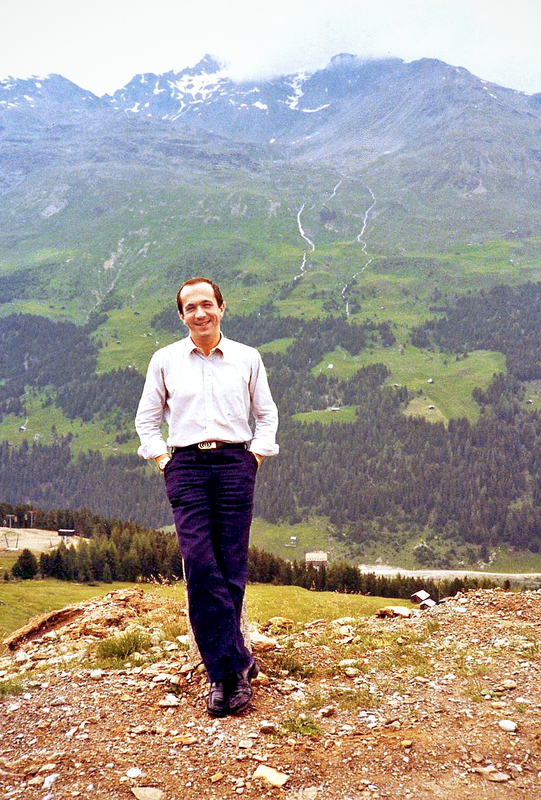 Aldo, Fabrizio’s father had purchased the property in 1960 after falling in love with the enchanting view from the estate’s terrace. Not long after that, Fabrizio fell in love with the wines he found on the estate and began his own journey down the difficult but rewarding path of learning the secrets of what transforms grapes into wine – and especially what makes a great Tuscan wine. “He was way ahead of the times”, Laura pointed out, “so I benefited from that.” She joined him in 1989. Under his tutelage and alongside winemaker Andrea Giovannini, Monsanto has become one of the most respected wineries of Tuscany. Fabrizio spoke about as much English as I speak Italian, but we managed to somehow have a warm and informative conversation. Lots of hand gestures! And translations by Laura. Always he had a twinkle in his eyes – just like his daughter. They are both known for their sense of humor. The visit was enchanting – just like the two of them. We said our goodbyes to our new friends, and were then escorted to our car by our new four-legged friend Chuck. He already knew how to be a great Monsanto ambassador. Fall may be my favorite season – both in Tuscany and in Chicago where I live – but I really love all of the seasons and what each represents. I couldn’t live in an area that did not have a clear seasonal cycle, even if at times I want to shoo away the dreariness and cold of a long Chicago winter. Transition and transformation bring new things – new activities, new state of mind, new foods. I love those changes. My Italian journeys have always reminded me of that fact. They have always emphasized the importance and delight of eating local foods in season. And though almost all Italian regions embrace that same philosophy to one degree or another, it is never clearer to me in than when I am in Tuscany. Maybe it’s because Tuscans celebrate the results of the wonderful products that sprout from their very lush, very fertile soil. Or that so many vineyards celebrate the harvest. Or perhaps it’s the ever-present olive growers. Whatever the reason, I find the combination of Tuscan ingredients and the Tuscan people to be a truly distinctive one. And that blend of people, tastes and perspective keeps me coming back here time and time again. Glancing out the window of an Alitalia jet on yet another of my regional trips across Italy, I was confronted with an image that was both unsettling and beautiful. Ominous puffs of steam and angry explosions of lava spewed out of the crown of an absurdly archetypical volcanic mountaintop set against an implausibly cerulean Mediterranean Sea that dominated the view from the airplane. I knew from the guidebook on my lap that this was Mount Etna, a perpetually active volcano that looms threateningly over this strange and spectacular island even during those rare periods when it is “dormant.” Full of contradiction, Etna helped create this island floating off the tip of Italy’s mainland a half a million years before I flew past it, but always reserves the right to destroy the land surrounding it. Both protector and enemy, its mineral-rich ash continuously feeds the local flora and shapes the taste of this great island’s indigenous food and wine, while its frequent rumblings never let the locals forget that a powerful force – one completely beyond their control – sits watch over everything on this island. Needles to say…my Sicilian experience began in a surreal way. I found myself at many points during my time there thinking of the famous surrealistic painter Salvador Dali who would have been inspired by many of the images we encountered during our long, strange weekend in Sicily. Dali was constantly blending the real world and his imagined version of that reality into remarkable paintings that defined surrealism. But the “reality” we saw and experienced in Sicily was bizarre on its own terms. And that was surreal enough for me! Green and grey were the colors that dominated my view from our car as we drove through the Sicilian countryside. The lush vegetation of the island was interrupted only by craggy, rocky hills; a scene I couldn’t help but associate with Copolla’s famous film, “The Godfather.” I could clearly see Al Pacino’s character, Michael Corleone somberly walking the rugged, stony countryside with two imposing bodyguards always at his side. The steep, winding roads leading to Taormina were too great a temptation for my former-racecar driver and business partner Paolo Volpara to ignore. Hairpin turns were his specialty. Ironic that my very first hair-raising drive with Paolo took place on this very island five years earlier during an advertising conference. He and my then husband Bob had arranged a meeting with the European Manager Directors in Taormina. During a break in one of the meetings Paolo offered to take several of us for a ride through the village and into the hills around Taormina. I was invited to sit in the front seat. Thirty minutes of terror later we arrived back at our hotel all with white knuckles and clinched teeth. I was grateful we had not killed anyone – or ourselves. Little did I know that I would one day be back to this beautiful village with that same crazy racecar driver, now as my business partner and friend. By then he had convinced me that even though he drove fast that he was an incredibly safe and excellent driver. Excellent I agreed with. Safe – hmmm? I was never able to persuade him that a less excellent driver might come out of nowhere and it would be impossible to prevent a calamity. He’s still with us, however. So maybe he was right! We had lunch in Lower Taormina at a restaurant by the sea facing Isola Bella, a tiny island and nature reserve tucked close into the harbor connected to the mainland by only a narrow stretch of land. Our focus this trip was on Convito’s new bar, which was to be a part of our newest downtown Chicago location. So in addition to studying the regional food and the wine as we always did, we also wanted to sample some typical Italian cocktails that might become a part of our new bar menu – cocktails that would please the American palate while still remaining true to their roots in Italian culture. We began our lunch with the Sicilian antipasto relish known as caponata. It consists of chopped sautéed eggplant, tomatoes, celery, onions and capers in a sweet and sour sauce. The name Caponata is thought to have derived from the Catalan word caponada – a similar relish from Catalonia in northeastern Spain. That makes sense since Catalan invaders came to Sicily as early as the thirteen hundreds. But as usual, there are several other stories about caponata’s origins. One suggests that it must have been a recipe invented on the sea as a mariner’s dish because of the large amount of vinegar it contained which was a quick way to keep food edible for extended periods of time. Convito has a Caponata story all its own. We have been making it almost from the day we opened in 1980. The kitchen in our first tiny store was a 4-burner electric stove smack dab in back of our deli adjacent to our meat slicer. Waiting on customers, slicing meats and preparing salads all at the same time was difficult to say the least – especially the salad prep and cooking aspects of the business. From Convito’s inception, our plan was to offer customers an array of salads and antipasti that we would prepare each morning on premise. During those first weeks and months, I did the majority of the cooking with the occasional assistance of some of the more talented cooks on the Convito staff. But none of us had worked in a high volume professional kitchen and what I didn’t plan on was how popular prepared foods would be. It became impossible to keep up with the demand. Roast the eggplant. Chop coarsely. Set aside. Cool. Add the tomatoes and cook for 5 to 10 minutes. Add the capers, olives. Mix well. Add the sugar and vinegar. Turn the heat to low and cook for about 20 minutes stirring frequently. The dish should be thick and sweet. Season with salt & freshly ground pepper to taste. Allow to cool. Serve at room temperature. Serving suggestions: with bruschetta or as a delicious relish on grilled fish. Our headquarters that weekend was the San Domenico Palace Hotel, an elegant Renaissance-inspired hotel with beautiful terraces overlooking the Bay of Taormina and Mount Etna. It was built on the original structure of a former 15th century Dominican monastery transformed in the late eighteen hundreds to a hotel. Lots of “monk paraphernalia” was scattered throughout the lobby and hallways giving the hotel the strange feel of a fashion-conscious monastery that one might find in a Fellini movie. Taormina itself is lovely. Often described as a Sicilian Monte Carlo, it was a nineteenth century favorite of the English aristocracy, a location where self-exiled author D. H. Lawrence was inspired to write Lady Chatterley’s Lover. It is still a gathering point for artists and authors. We walked through the winding medieval passages of the town in search of a suitable bar where we could begin our research on Convito’s new liquor menu. Until 1984 Convito had served only wine and beer. Our new bar would open almost immediately upon my return to Chicago, and I was anxious to make sure it had an authentic and unique character that matched what I had been doing with food for many years by this point. But not being a cocktail type – I was a wine girl myself – I was curious whether some of the local drinks might translate well to a Chicago audience. Sunday was to be a day of exploration. We drove to Messina the 3rd largest city in Sicily known for its curved seaport (almost like a hook) and long and complicated history of power and conquest. Lunch at Pippo Nunnari, a restaurant with its own adjacent food store was especially interesting to me. I always get ideas from any food establishment that combines a restaurant with a market like we were doing at Convito. My favorite of course is Pecks in Milan. (Blog – Lombardia II Milano – Street Smarts) First I was amazed that a store was even open on Sunday in Italy (back then almost nothing was open on Sundays in this very religious country) and then astounded at the number of people who crowded around the food cases making it almost impossible for me to even see what was in them. I did catch glimpses of pristine cheeses and a whole assortment of fresh and aged sausages. The food, the displays, the crowds of people reminded me of Zabar’s in New York, a food emporium that always seemed bustling even during non-peek hours, but in Pecks I found an authentic Italian perspective that I always sought to emulate at Convito. We had lunch in the restaurant adjacent to the market. The crowd appeared to be a combination of “after mass” folks and hungry tourists. I ordered the specialty of the restaurant and of the area – Pasta alla Norma – the famous tomato eggplant pasta dish. It is my kind of dish. Tomato combined with just about anything appeals to my “savory-tooth”. This very peasant, very simple item appears on almost every Sicilian menu. Whenever I write about a new part of Italy I always check the regional cookbook collection that Paolo gave me back in the early eighties – the “In Bocca” series. Each book contains regional recipes, wonderful art and priceless translations as well as great stories about the history of many of the regional dishes. In the “Sicilia e le isole” book it states – “the recipe for Pasta alla Norma derives clearly from Catania and maybe it has been called so in order to connect it with the highest lyric composition by Bellini (the tragic opera Norma)”. I chose to use the Pasta alla Norma recipe (following) from the book instead of Convito’s more precise recipe. It is much more vague and less specific than ours – sort of the way Italian home cooks cook – by feel and emotion. “Creativity should never be impeded by a mere recipe,” my partner Wanda Bottino would say. The translated recipe follows: “Prepare a tomato sauce as usual and flavour it with basil. Cut 3 nice Sicilian eggplants into cubes, put them in a colander, salt them and leave them there for about 1 hour so that they loose the bitter liquid. Finally fry them. Boil 700 grams of pasta until chewy but not soft and season them with tomato sauce. Prepare the individual helpings and enrich them with some of the eggplant and a good amount of grated salted “ricotta”. After lunch we drove along the seaside through many tiny villages. The land was parched. The villages for the most part were poor with many of the houses displaying large patches of decaying walls where the stucco had worn away exposing old worn brick. Occasionally we would see a person or two standing in drab doorways looking out over an expanse of nothing. These pockets of poverty were sad to see but not unexpected. Sicily is one of Italy’s poorest regions, with low incomes and high levels of unemployment. Today even though tourism is increasing rapidly each year and adding to a growing economy, unemployment remains high. The first signs of fall color came into view as we approached the vineyards. A carpet of red and yellow leaves surrounded the vines and signaled the vineyard’s preparation for a season of rest. Now and then we saw a blanket of orange – the blood oranges of Sicily. Although blood oranges supposedly originated in China they are most closely associated with Sicily. They have a distinct raspberry-like citrus profile. A salad Convito has featured through the years is a classic Sicilian dish featuring seasonal blood oranges combined with shaved fennel and olive oil. The licorice flavor of fennel works beautifully with the unusual sweetness of blood oranges. We have also at times added black olives that lends another color as well an interesting taste to the salad. Novara di Sicilia, a small village nestled in the mountains was our next Dali-esque experience. As we entered the town we saw almost no one. The cobbled streets were empty and the stores closed. Silence dominated. We wondered if this was some kind of holiday or that most of the citizens of this small typical medieval town were elsewhere possibly celebrating the Day of the Dead. Slightly unnerved we hopped back in the car and shot out of town. Shortly after leaving Novara we noticed a portion of the road had fallen. No wonder there’s no traffic up here. The lane closest to the mountain was scattered with falling rocks. Strange, half finished houses – now deserted – appeared intermittently along the roadside. We went higher up the mountainside into the fingers of a cloud, which had deposited ripples of moisture on the surrounding roads and valleys giving the landscape an unearthly quality. I almost expected to see a limp Dali watch draped over the foggy mountainside. We were mystified by our findings – or lack thereof – so when we returned to the hotel, I looked up a description of this village in our travel guide and found a whole list of festivals celebrated throughout the year. We never returned and never figured out why the village was so deserted during our visit but chalked up the whole eerie experience to yet another strange occurrence in an increasingly strange weekend. Back in Taormina we had a light dinner at the hotel then walked back to the center to sample a few more cocktails. This time we chose the Valentino Piano Bar, an upscale option not far from the hotel. It looked a little like a brothel – though a classy one – with velvet papered walls. But instead of the usual red velvet these were blue. I ordered a drink I knew I liked, the classic Harry’s Bar Bellini with peach juice and Prosecco. What is not to like? Later I ordered a drink with the juice of Sicilian blood oranges. It was divine. I can’t remember the ingredients (I neglected to identify them in my journal, an oversight perhaps attributable to the nature of this particular research!) so I asked my son-in-law (and this blog’s photographer) to invent one. He is our family “mixologist” always experimenting with different combinations of ingredients whether in new sauces or new cocktails. I’ve tried this cocktail and it is delicious! In a cocktail shaker filled with ice, combine the tequila, lime juice and blood orange juice. Shake until well chilled. Strain into a glass filled with ice, top with the blood orange soda and garnish with a lime wedge. Our last day was spent in Siracusa. I, a student of history, did not realize when I was studying Ancient Greece that the Syracuse I was studying was actually the Syracuse we were about to visit – on the island of Sicily – not in Greece. The traffic getting there was horrific. Several miles before entering the city we drove by the largest oil refinery I had ever seen – a whole city unto itself. Cathedrals of metal and steel penetrated the sky like a ghoulish Manhattan. The stench was terrible. Time to end the Industrial Revolution, I thought. Ancient Syracuse, at one time one of the major powers of the Mediterranean, was a magical and powerful experience. Greek influence was not so much in evidence in the buildings near the port mainly because other invading countries had left their mark long after the Greek glory had faded. Lovely billowy wrought iron balconies and buildings with Baroque facades revealed traces of Spanish invaders. Even though much of the port was in disrepair, I decided that if the graffiti could be wiped from the walls, a fresh coat of stucco applied on the now corroded houses and balconies repaired and refurbished, it would be possible to hear the whispers of a grand and elegant past. Remains of ancient Greece, however, were spread over a tremendous expanse. And what a past it was! Its ancient Greek theatre was especially impressive. Sixty-seven rows divided into nine sections with eight aisles is one of the largest amphitheatres ever built by the ancient Greeks. Even so, the tour was fascinating. I stuck close to Paolo and tried to be as unobtrusive as possible and just enjoy the scenery. The point on which the castle rested was incredible. You could see for miles in every direction. Certainly a perfect place for a fortress. We finished the tour, stopped at a beautiful baroque fountain in the center of town where many little makeshift stands were selling gifts and flowers for the Day of the Dead celebration. I bought a colorful little ceramic vase by the famous ceramic artist Giovanni de Simone who at one time studied under Picasso. Clearly you could see his mentor’s influence – as well as a little bit of the whimsy of Salvador Dali. Later I learned that Picasso and Dali had influenced each other at certain times during their very prolific careers and that there have been exhibits and articles about their connection. Dali seemed to be following me around that weekend – even in my choice of a souvenir. Our last morning in Taormina was gorgeous. We walked through the beautiful gardens of the San Domenico Palace Hotel before taking a final stroll in Taormina to view all of the ancient Greek-Roman sights and to have one last meal and cocktail before we left for the airport. We chose a lovely restaurant near the sea where we could hear the lapping waves of the Mediterranean brushing softly against the rocky coast. Our cocktail research was coming to an end. After sampling many typical Italian drinks – and some not so typical – we narrowed our choices to three for our Chicago bar selection – the Bellini, the Americano and the Negroni. We also decided that it would be fun to invent a new cocktail each season – one based on Italian liqueurs. However, we surmised that the main draw to Convito’s bar would be Italian wines – red, white and sparkling – by the glass – a phenomenon that had not been around that long. In the fifties, sixties and early seventies, wine was not necessarily the drink of choice. Although wine was available in many restaurants, it was mostly sold by the bottle not the glass. Or if by the glass, the wine was simply described as white or red – usually neither very good. Cocktails like Martinis and Manhattans seemed to be the drinks of choice. Even with dinner. I love the old movies of those eras where everyone seems to have a cocktail in one hand and a cigarette in the other. But times had changed. In the early eighties a wine culture was developing in America and Convito was on the forefront of that trend. An increasing number of restaurants and bars carried an assortment of wines by the glass exposing customers to wines from different countries and many different varietals. It was an exciting time for Convito and for wine in our culture. Today our Convito Café continues the tradition of offering a seasonal cocktail as well as a selection of wines by the glass. We always have five whites, five reds and two sparkling wines available by the glass. Our wine list is comprised of mostly Italian wines but we also feature particularly fine varieties from France, California and other countries. I could not leave Sicily without ordering tuna, one of the fish most frequently found on the menu. Tuna fishing has a long history in Sicily. For hundreds of years, tuna fishermen used nets to capture the large Mediterranean bluefin tuna. Today the tuna are diminishing in size and numbers requiring certain restrictions and regulations on fishing but tuna continues to be the most popular fish in this region. The following recipe is another from the “In Bocca” series cookbook. “As tunny is a common fish here, we give you an easy recipe to prepare it. Cut 1 not thick slice of tunny per person and arrange them on the bottom of a baking pan greased with oil. Cover the slices with a layer of breadcrumbs and dot the surface with pieces of peeled tomatoes, salted capers, (previously washed) and chopped green onions. Salt, moisten with a drop of oil and bake for 35 – 40 minutes in a medium hot oven. Dry tuna steak. Spread some of the olive oil on the bottom of a baking dish. Rub some of oil on tuna. Sprinkle with sea salt and chili pepper flakes. Place olives, capers, basil and tomatoes on top of tuna. Sprinkle with breadcrumbs and drizzle with remaining olive oil. Place in oven and bake for 15 minutes or until the tuna is done to your taste. At dusk before we went to the airport Paolo decided our trip wouldn’t be complete without a drive up Mount Etna. The small hillside villages were soon left behind as we drove higher up the volcano. “Are you sure this is safe?” I asked Paolo as our surroundings became more desolate and foreboding. “Never know,” he replied concentrating on the road, which was becoming increasingly difficult to navigate. As we neared the summit I noticed there were no longer any streetlights to guide our way back down. Great! That would certainly be a perfect ending to our already completely surreal regional journey. Looking out the window I was again struck by a surreal realization. Lava was everywhere. It had long since transformed from its initial red-hot, molten state and now took the form of the ubiquitous black stone that was used as structure: it paved the streets, arched the doorways, lined the sidewalks. Even vineyards featured black lava trellises. Black, black everywhere. Shockingly, as we neared the summit we found ourselves driving over brand new roads that had already replaced those destroyed in the last eruption. Oh, the optimism! The pragmatist in me found it hard to understand why people still live near this powerful, unpredictable volcano. But the danger is not without benefit. Accumulated volcanic ash leaves a uniquely nutrient-rich layer of soil that has much to do with the fertile nature of this island. They grow citrus fruit, grapes, olives and vegetables in this enriched soil. Tourism also thrives as visitors come from all over to hopefully marvel at the fiery display Mt. Etna might provide. One is never certain. Mt. Etna is most certainly unpredictable and temperamental. But all things said, residents seem to have a strong personal connection to the area and a great love and respect for this volcano. Looking out the rear window of the car, however, we could still see patches of twinkling candlelight scattered over the landscape way off in the distance – macabre leftovers of “I juornu re Muorti”. Contrasted with the sea of black lava, it was an eerie, “Daliesque” sight. As dusk gave way to night, Paolo and I found ourselves standing outside the car, lost in the eerie beauty of the scene at the summit. We might still be there were it not for the sudden realization that we were now in danger of missing our flight. So once again I was to destined to experience another “Paolo-Volpara-scary-drive.” This time it was reminiscent of the car chase I remember seeing in the 1971 William Friedkin movie “The French Connection” where oncoming cars were narrowly missed and traffic signals completely ignored. Its harrowing nature, however, seemed to fit the theme of the weekend. Though most of the scenery flew by in a blur that night, one vision still stays with me. Not long after we left the summit, we passed a single wall of a house that stood amidst a petrified river of lava that had completely overrun the rest of it. Immediately next to it, another home remained completely intact – two huge streams of lava parting at the front door of the house as if some supernatural hand had diverted destruction from the doorstep. Etna’s power and cruelty became crystal clear to me with that one image. Rivers of recent lava (from an eruption just two months prior) carved its blackness into the mountainside. Some areas of dense forest were spared while others were covered in blackness. The arbitrariness of it all was unsettling. Somehow it seemed very appropriate that we would end our trip with this final surreal journey up and down Mount Etna – our fantastic and bizarre touchstone for the weekend. The events and images of our trip are forever emblazoned in my mind beginning and ending with this amazing volcano. Ultimately we made our flight and back to Milan we flew relieved that we were in one piece and very pleased with our research and all the wonderful things we had seen on this strange and spectacular island. My surreal Sicily sojourn! One I would long remember! Driving through the ancient town of Modena on a brisk, clear autumn day, I found myself scanning rooftops hoping to spot yet another one of Modena’s famous attics. I had been told that almost all of these dark, dusty spaces were crammed full of wooden barrels of varying sizes, all of which contained – but only after the appropriate aging period – Aceto Balsamico, aka Balsamic Vinegar. I had read many an article about the aging process of this illustrious “brew,” how each year the vinegar is transferred to a different wood barrel in order to obtain the flavor of all the different wood types resulting in a product of extraordinary complexity. Authentic, super-rich and syrupy balsamic depends on not only the quality of the grapes put into those barrels but also the length of the aging process, the timing of the transfer to the ever-smaller barrels and of course, the kind of wood being used which might be cherry, ash, chestnut, oak or mulberry. Ultimately, balsamic vinegar relies as much on the ingredients that go into it as the skill and care of the artisan making it. The environment also plays an important role in the aging process. Modena’s hot, dry summers followed by humid and cold winters make for perfect conditions. I was fortunate to actually visit one of those attics with Neil Empson, esteemed exporter of fine Italian wine and a good friend of Convito. The attic we examined – perched over a little rustic cottage right next to the restaurant we dined in that evening – was owned by the chef, an artisan himself. It was just as I imagined; a small dark space tucked under the slopping beams of the roof above it, smelling of the sweet and sour perfume so typical of Aceto Balsamico . To be labeled Aceto Balsamico Traditionale the vinegar has to be aged a minimum of 12 years, though some of the most highly sought after bottles are aged 25 years and beyond. In the dark, tight recesses of the chef’s private attic we tasted several different ages of balsamic each drizzled over slivers of Parmigiano Reggiano. The saltiness of the cheese combined with the sweetness of the vinegar made for a sublime partnership and I was hooked. Modena, the home to Balsamic Vinegar, is located in a flat section of Emilia-Romagna that is considered one of the richest agricultural areas in all of Italy. Fertile fields yield sugar beets, hemp, and juicy red tomatoes, shafts of wheat, rice and maize. I clearly remember being mesmerized by the miles of grapevines lacing the countryside and the sea of rosy cherry blossoms whose trees would soon yield Amarena cherries – the finest, most succulent and intensely flavorful cherries in the world. A few miles from Modena is Bologna. It is the capital of Emiglia-Romano, but is probably best know as the home to Bolognese; a succulent meat sauce that you can now find versions of all over the world. A myriad of stuffed pasta dishes like lasagna, tortellini, cappelletti and cannelloni were also all first created in Emilia-Romagna. And a great variety of sausages also come from all over this region; Mortadella, the smooth textured delicate pork sausage flavored with spices, whole or ground black peppers and myrtle berries is one of its most well-known. But perhaps most significantly, in just under an hour from Modena is the town of Parma, the home of Parmigiano-Reggiano and Prosciutto di Parma both of which are staples in Italian cooking across all regions of Italy. There is clearly good reason that this region is considered the gastronomical and culinary heart of Italy. It has an embarrassment of riches born of the care and standards of the local artisans who continue to make this region so important to the country. 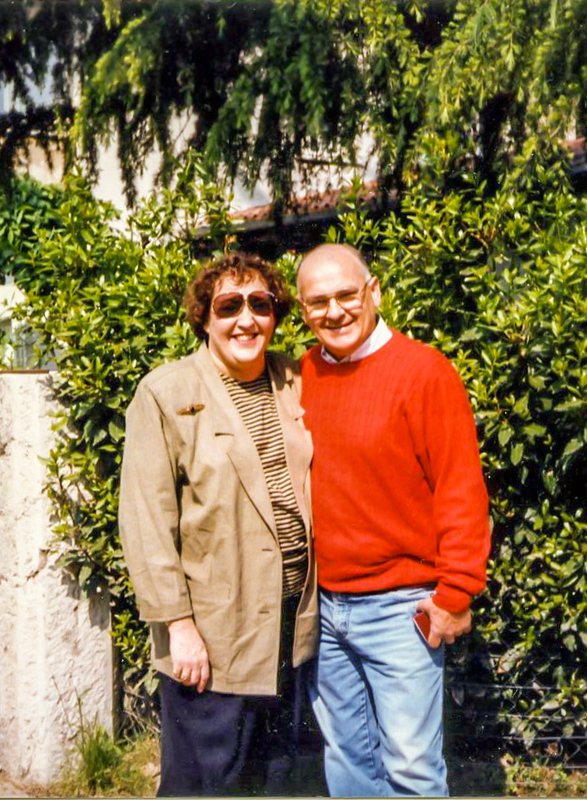 My partner, Wanda Bottino, loved and used Emilia-Romano products almost every time we cooked together. Parmigiano-Reggiano was a main ingredient (or at least a finishing garnish) in many of the dishes we cooked in her kitchen. And the uses for Balsamic Vinegar and Prosciutto di Parma were endless. Because of their popularity in the world today, all three have been copied – or at least there has been an attempt to copy them – though in Wanda’s opinion (and mine) mostly of those imitations are woefully inadequate replications. True Parmigiano-Reggiano was her favorite. “Assaggia” (taste it) she would say. “Casual” tasting would not do for Wanda. She wanted me to savor each and every bite – to concentrate on the flavors in my mouth. Throughout each session we tasted at every step of the cooking process making sure the dish we were cooking had the correct seasoning and was of the right consistency. Since my time was limited (I had to get back to Convito in the U.S.) we often cooked up to fifteen different regional dishes in an afternoon. Needless to say, it was sometimes difficult working up an appetite for dinner after one of those marathon sessions. In addition to learning about taste, I loved learning product history. Emilia-Romagna had an abundance of fascinating stories to match each of its renowned products. Many dated all the way back to the Middle Ages where food was often more than just sustenance. Balsamic vinegar for instance began as a “miracle cure” for sore throats and even labor pains! Stories about intrigue and jealously particularly piqued my curiosity. Certain monk orders fiercely protected their cheese recipes from neighboring monasteries. They went to great lengths to keep secret the meticulous production techniques their order had developed through the years. The history major in me delighted in that kind of research – going back to the very beginnings of why and how an excellent product came about even though in some cases, the earliest stories were nothing more than folklore. However, folklore can sometimes give us a hint as to the true origins of a product. Great food accompanied by great stories makes eating so much more interesting. I followed Wanda’s tasting advice when I opened Convito. Two to three times a year we open bottles of all our best Balsamic Vinegars and Extra Virgin Olive Oils (as well as other products), giving our customers the opportunity to evaluate the many oils and vinegars holding their secrets within those beautiful jars sitting on our grocery shelves. It is not so easy for anyone to pay $45.00 or more for a bottle of aged Balsamic Vinegar until they taste it and understand firsthand the difference between our offerings and something from a supermarket that costs a quarter of the price. An example is Villa Manodori Artigianale Balsamic Vinegar made by Massumo Bottura, chef of a restaurant in Modena. It is produced in very limited quantities with Trebbiano grapes aged in oak, chestnut and juniper berries. Why should it cost so much more than the bottle also labeled Balsamic Vinegar for $6.99? “Assaggia” – Taste it! The vinegar itself tells its own story. To this day I love to use fine, aged Balsamic Vinegar as a glaze for veal, rib eye or pork. Or sometimes I sprinkle a few drops over strawberries or as a finish to a stew. But I pretty much stick to red wine vinegar for dressing my salads. However, famous chefs like Mario Battali use it in his his fantastic Arugula and Parmigiano salad at Babbo in New York City. He actually names the specific producer in the descrption of the dish (Villa Manodori Artigianale Balsamic Vinegar made by Massumo Bottura). There is clearly room for personal interpretation when it comes to using this amazing vinegar! Heat the oil in a heavy skillet over medium-high heat. Dry the chops and coat both sides of veal chops with flour. (Shake off excess flour) Place the chops and the sage in the hot oil and cook for approximately 4 to 5 minutes per side. Add the sage near the end of that browning time. (Do not cook too long or veal will become dry – should be a rosy pink and moist) When cooked, remove to a warm platter. Season with salt and freshly ground pepper. Add the wine to pan and raise the heat to high scraping up and brown bits and boiling until the sauce has thickened. Turn the heat to low, add the balsamic and heat then whisk in the butter. Return the chops to the pan coating them with the sauce. Serve immediately. I visited the Emilia-Romagna region frequently with Paolo in the early eighties because it was close to his home turf, Milan. Bologna, its capital, is home to one of the world’s great universities. While Paolo attended a conference or a business meeting, I often wandered the handsome portico lined streets of the city – some 40 kilometers of arches and columns, Paolo pointed out. It was delightful to stroll around the center of the city under them – protected from any kind of weather – rain, sleet, snow or even extreme heat. The buildings in restful colors of sienna, misty rose, faded reds and burnt orange emanated a calm, quiet intellect so representative of the city itself. Bologna also has a network of secret canals built originally as a source of water and as a major method of moving goods around the city. Though most of them have been covered over, some of these “hidden” canals remain. Unlike Venice, Bologna eventually decided that the fastest way to move people and goods around a city was with motorized vehicles. The city didn’t drain off or fill in its canals like many cities did but simply covered them to build roads and parking lots. So many still exist (mostly running below the streets). You just have to know where. Some can be seen from a bridge or an alley or a secret window. Paolo took great pride in “uncovering” this charming part of Bologna for me. Never could I have found it on my own. Perusing its many historic food markets was also a favorite pastime – especially the Quadrilatero market located off the main square in the central district of the city. It is an area packed with vendors of every kind all crowded into narrow little streets just like it was in medieval times. Because I was a tourist and not looking to buy ingredients to take home to cook, my enjoyment of this incredible market consisted mainly of meandering down its cobblestoned streets gazing at the abundance of high quality food stalls all brought together in one spot. Smells of pastries, great cheeses and sausages wafted through the air, whetting my appetite and encouraging me to pause at one of its outside cafes to order a Salami Panini and a glass of Lambrusco (Emila- Romagna’s famous floral fruity red wine). It was also a chance to sit and admire the interesting mix of people dressed in everything from jeans to formal suits all in pursuit of great food. My kind of people! It was impossible not to be tempted by the cured meats in this region. One lunch in particular in the heart of Bologna, a huge mortadella was displayed on a grand wooden table in the center of the restaurant dominating the room and filling it with its unique spicy fragrance. How could I not order a few slices to begin the meal? Delicious – smooth and savory, we could not resist ordering seconds. “Can you believe”, Paolo mused, “ that this sausage is the forerunner to your baloney?” Italian Mortadella is, of course, a more delicate, better-seasoned cured meat than our American boloney. No question. But I have to admit, having grown up in the American Midwest and still harboring a fondness for simple foods, I am a baloney-kind-of-gal. A couple slices slapped between two pieces of good bread with a smear of mustard and a leaf or two of lettuce may not be a gourmet lunch but regardless, it is still very satisfying none-the-less. And being from Wisconsin where we take our deli meats seriously, a good ring bologna with the right amount of seasonings and spices and high quality pork and beef makes for a delicious Sunday supper alongside fried potatoes and maybe a little sauerkraut. (It’s true – Italy hasn’t taken all of the German out of me! My Alsatian roots often rear their savory-sour head). The city of Bologna is often referred to as “la grassa” –literally meaning “the fat”. Ever since the Middle Ages Bologna was known for its rich food culture. “The fat” doesn’t so much refer to the fat content of the food but to its abundance, its variety and its high quality. The cuisine, though rich and succulent, is refined. Bolognese sauce is a perfect example. The authentic version is delicate, creamy and subtle – in other words, a refined meat sauce. However, Bolognese in America has become a generic name for “meat sauce”. One critic a few years back commented that they preferred a spicy Bolognese sauce to the one we serve at Convito. Really a complete oxymoron. Spicy meat sauces are great (we actually sell one in our market called San Marzano Napoletana Meat Sauce) but in no way should the adjective spicy describe authentic Bolognese sauce. Our Bolognese sauce recipe begins with the classic Italian soffritto, a mixture of chopped onions, carrots, celery and garlic (the foundation to many Italian sauces) sautéed in olive oil. The meat is added, then the spices and then the milk, Not all recipes call for milk but Wanda insisted that the milk coats and protects the meat from the acid brought in from the wine which is added next. Although tomatoes are an ingredient, Bolognese sauce is basically a MEAT sauce – a slow cooked, delicate and delicious meat sauce building on the basic soffritto – the classic Italian start of many a sauce bringing succulence and flavor just like the French mirepoix. Convito’s Pappardelle with Bolognese Sauce is one of our most popular café items – one of those dishes we would not dare take off the menu. In a large skillet heat the olive oil with the butter until butter is melted. Add the onion and sauté until transparent. Add the garlic, carrots and celery and cook for about 3 minutes. Add the ground beef and pork with some salt and freshly ground pepper and cook until the meat has lost its raw red color. Add the bay leaf, the rosemary and a pinch of nutmeg. Stir into sauce. Add the milk and let it simmer gently until evaporated. Add the wine and simmer until it has evaporated. Then add the tomatoes and simmer very gently for approximately 1 ½ hours stirring to make sure the sauce is not sticking and flavors meld. 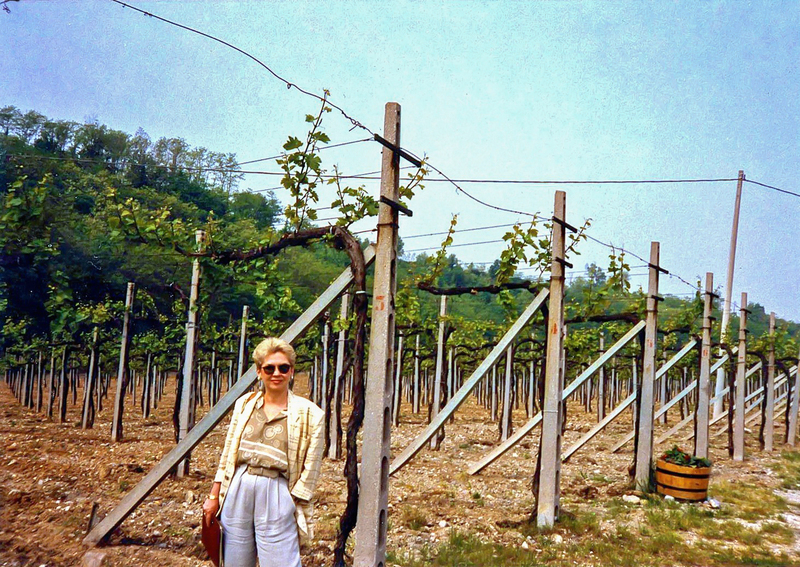 In the summer of 1985 when I was in Milan to work with Wanda on Emilia-Romagna recipes, Paolo and I made yet another trip to this region. On our way back from Bologna we stopped for dinner at a small informal restaurant in Parma called Degusteria Romani. The décor was simple yet tasteful. Paolo chose this restaurant because he was told “you can’t go to Parma without eating there”. The restaurant is known for its authentic Emilia-Romagna cuisine. Our waiter insisted that we begin our meal with some paper-thin slices of Prosciutto di Parma reminding us that this particular prosciutto is produced in the hills around Parma. Here again, curing a leg of pork correctly is a painstaking process requiring the instincts of a great artisan. – instincts like so many of the artisans in this region. With this carefully controlled process, the ham absorbs only enough of the pure sea salt to preserve it. Just like balsamic vinegar, the product is reduced in size (with prosciutto – to a quarter of its weight). The reduction comes about through moisture loss and trimming. That process helps to concentrate the flavor and gives it that distinctive full-bodied taste and aroma. So buttery the slices were, they dissolved in my mouth leaving a fragrant and salty aftertaste. Paper-thin slices of prosciutto are often difficult to achieve. I should know – I had to be trained on the meat slicer when I first opened Convito. Too thin – the slices fall apart; too thick – even the best prosciutto will be chewy. A well presented slice will always be served with a ring of fat around it. This lends flavor and helps keeps the slices fresh. The perfect slice should be just thin enough that the prosciutto melts in your mouth. Sadly, I was never an expert slicer (I always erred on cutting it too thin and then ended up snacking on the detritus of my efforts) but fortunately for me, many of our Convito salespeople are. me about to learn how to slice prosciutto. Yikes! Italy offers another excellent prosciutto – Prosciutto di San Daniele (blog – Friuli-Venezia-Giulia “A Second Look”). For me, most domestic prosciuttos have proved disappointing, but one produced in Iowa – La Quercia is a fine substitute for the imported ones. I suspect it has something to do with the whole curing process as well as the origin of the pork. The La Quercia prosciutto artisans understand that there is no short cut to excellence and they have single-handedly brought excellent prosciutto production to the U.S.
We continued our meal with another well-know product from the Parma area – Parmigiano–Reggiano. Like Aceto Balsamico Originale and Prosciutto di Parma it is made with the same care and exacting standards. We started with a bowl of tortellini in brodo (little stuffed pasta pouches shaped like a person’s navel) and, of course, plenty of Parmigiano-Reggiano grated on top. Then came a simple pan-crisped chicken with rosemary served with baked asparagus. The baked asparagus had also been prepared with plenty of grated Parmigiano-Reggiano. It was the essence of simplicity: only 5 ingredients; in-season asparagus, local Parmigiano, butter, salt and pepper. A wonderful side dish or good enough as the whole meal. Butter a rectangular baking dish. Arranged the cooked asparagus in the dish next to one another in slightly overlapping rows. Do not cover the tips. Sprinkle each row with salt and pepper and Parmigiano-Reggiano and dot with butter. Bake in upper part of the oven for 15 minutes until a golden crust forms. Serve immediately. The first recorded reference to Parmigiano-Reggiano dates back to 1344 discovered in the purchasing ledger of a priory’s refectory. It comes as no surprise to many that this cheese comes from this region where the monks had been experimenting with cheese making for centuries. Reference to it can also be found in Bocaccio’s 1353 masterpiece, the Decameron. Real Parmigiano-Reggiano, referred to as “The King of Cheeses” is highly regulated. It can be made only in specific regions from mid-April to mid-November. That specific timing ensures that the milk comes from cows pastured on fresh local grass. Finally the large cheese wheels laid out in long rows in temperature-controlled maturation rooms are aged to perfection producing a marvelous cheese that is hard and sharp with a rich deep flavor. When grated over any pasta dish – really any dish – it transforms the dish into something extraordinary. Most of our domestic cheeses generically called Parmesan are pale in color and nowhere near the flavor of Parmigiano-Reggiano. Is domestic Parmesan bad? No, not necessarily (though what I have occasionally found in many restaurants in this country bears more resemblance to sawdust that cheese). Because of the cost of the real thing, many dishes contain the domestic variety – pizzas, lasagnas, Caesar Salad and many more. If the real thing was used as a main ingredient the costs of those dishes would escalate dramatically. But when you are looking to make a simple dish superb, buy the real thing. It can easily be stored in your refrigerator wrapped in a freezer ziploc bag for at least 6 months. Or you can also freeze it for even longer. Buy a big hunk, split it between fridge and freezer, and bring it out both for your most important occasions and to transform simple weekday meals into something special. Complexities abound in two-worded, hyphenated Emilia-Romagna. Both Emilia and Romagna contain numerous important cities each with their own personality, each with their own influence on the region. Although I made several visits to Bologna, many of the other towns and villages I visited only one or maybe two times. Since my focus was on regional cuisine I always tried to order the dish or dishes the city was most identified by. In Ferrara I ordered the classic signature dish of the city – pumpkin cappellacci with a sage brown butter sauce (cappellacci are stuffed pasta squares or rounds). It was a perfect pairing – the sweetness of the pumpkin and the savory of the browned butter and sage still linger on my palate. Another vivid memory of Ferrara is the Palazzo Dei Diamanti, a Renaissance-style building whose striking exterior walls are comprised of some 8,500 white marble blocks carved to represent diamonds. There are so many beautiful buildings in Italy but this building, for some reason, remains in my memory. One of my last trip to ER with Paolo happened in the autumn of 1985. We traveled there on a weekend to visit cities closer to the Adriatic in the Romagna part of the region. A taste of the sea prevails in this area especially in the towns right on the Adriatic like Rimini. Rimini is Italy’s premier party spot attracting holidaymakers since the 1800’s. Since we came in the fall, we didn’t see the ubiquitous array of brightly colored umbrellas that usually lace the 9 miles of prime sandy beaches. But we did see the blue sea and tasted it in many meals over the weekend. A delicious fish soup called Brodetto was one that has always lingered in my memory. We have made fish soup at Convito (Liguria I “Poets & Pesto) that is more of a peasant dish, but this one was especially aromatic and fragrant using the fresh herbs famous in this area along with clams, shrimp and sea bass from the Adriatic. All along the coast of Romagna many types of fish are found on the menu (amberjack, mackerel, bonito, tuna, porgy) as well as seafood and eels from the lagoons in the Comacchio valleys, a series of contiguous brackish lagoons situated close to the sea. The next day we travelled a short distance from Rimini to Ravenna where we marveled at the spectacular Byzantine mosaics in this Unesco World Heritage site. I was floored. Paolo told me story after story of Ravenna’s complex history, but I quickly realized one day would was not enough to take in the architecture, the mosaics and the culture of this amazing city. I would eventually return a few years later to further marvel at the city’s history, but spent hours studying it before I came back. This trip was one of the few times in my travels with Paolo where food and wine took a back seat to culture. We were so busy feasting our eyes on the many treasures of Ravenna that we only had time for a late lunch at a cozy wine bar. My memories of Ravenna are dominated by those early Christian mosaics and monuments, but I do remember being rejuvenated by an impressive fish antipasti spread featuring many gifts from the Adriatic and a fine glass of the dry version of the region’s Malvasia white wine – aromatic and perfect with our fish antipasti. We had dinner in Imola just outside of Bologna on our way back to Milan. Although pasta is the favored starch of Emilia-Romagna, risotto is also a part of the region’s cuisine especially in the areas close to the Adriatic. I loved this particular risotto which to me defined the very taste of the autumn season. I have tried to duplicate the recipe – successfully, I think! It is hearty enough to serve as a whole meal by itself. Bring the broth to a steady simmer in a large saucepan. Add the rice to the vegetable mixture and stir until it is thoroughly incorporated. Cook for 2 minutes. Add ½ cup of the simmering broth to the mixture. After the rice has absorbed the broth, continuing adding the broth, ½ cup at a time. Continue stirring over medium heat, making certain the rice is not sticking to the bottom of the pan and being careful not to add too much broth at one time. The rice is finished when it is firm but tender. The process will take approximately 20 to 25 minutes. If you run out of broth, add water. When you estimate the dish is a few minutes away from being done. Add the parmesan cheese and mix well. Taste for salt. Serve immediately. I am amazed at how many of the products of Emilia-Romagna are still an integral part of my cooking and eating repertoire. Grating Parmigiano-Regianno over my pasta occurs several times a week whether in my home or at Convito. Bolognese is my favorite meat sauce, which I happily devour a few times a month. Prosciutto is a product that always piques my interest whenever I see it on a menu, especially when paired with melon or figs. And although I may not have mortadella often, it is up there with my list of favorite sandwiches. My kitchen cupboard always houses aged Balsamic Vinegar, which I happily use as a condiment when I am cooking a chop or a steak. Even Amarena cherries preserved in syrup can occasionally be found in my household especially at the holidays when they serve as an excellent topping for ice cream or holiday panettone. But as much as I love all the specific products that I discovered in Emilia-Romagna, I think I may have been affected even more by the region’s ethics of production. The local artisans who create these essential Italian ingredients (both in this region as well as the rest of the country) consistently do so under self-imposed standards of care and excellence that I have rarely seen anywhere else. I have tried to bring that philosophy to my own life and to how we make food at Convito. I know that when we are at our best, it is because of this mindset. Such a rich region with so many excellent products – all with great stories of their origins and history. A bonus to eating all of these delicious products is that I actually know their stories. What could be better? As author, journalist and activist Michael Pollan said in one of his many brilliant “right-on” quotes about food: “At home I serve the kind of food I know the story behind.” It makes dining so much more interesting! Inspired by passion and immersion in everything Italian, I launched Convito in 1980 along with my two mentors Milanese residents Paolo Volpara and Wanda Bottino. It seems like only yesterday! But when I think of what was going on in Chicago in 1980 with “take-away” food, Italian products and Italian wine and even Italian restaurants, it seems like another century! Q: What are those wrinkly red things in my salad? A: They are sun-dried tomatoes (and in ten years you’ll be sick of seeing them in everything from pasta to salads to chip dip!). Q: I thought you said you only carried Italian wine yet none of the bottles on your shelf are enclosed in woven baskets. A: “Extra Virgin” olive oil is oil that is produced by a simple pressing of olives without added chemicals or cooking. It is the purest form of olive oil. “Prepared foods” in the early eighties were either mayonnaise-soaked potato salad or wilted coleslaw picked up at the local supermarket. We offered an array of soups, sauces, salads and antipasti bringing customers from all over the Chicago area. Pasta Fresca was made right in front of our customer’s eyes. We were a revelation to many, though some friends remained skeptics. One commented, “Isn’t opening an Italian specialty market like a doctor specializing in knee cap surgery?” Though I had great faith in our mission, I have to admit, comments like that sometimes made me wonder whether I was crazy to be undertaking such a venture. It turns out we were on to something. 35 year later sun-dried tomatoes can be found everywhere, Italian wine has the respect it deserves, Extra Virgin Olive Oil is a valued commodity and fresh pasta is no longer an oddity. Along the way Convito has adapted and changed priorities. We have continued to grow our award winning prepared foods selection and added scores of soups and sauces; we expanded our grocery department to include artisanal and specialty products not only from Italy but also from America and countries around the globe; we added an outside café. For 35 years we have been changing and adapting, adding and subtracting. Change is good for the soul. It has kept Convito relevant! 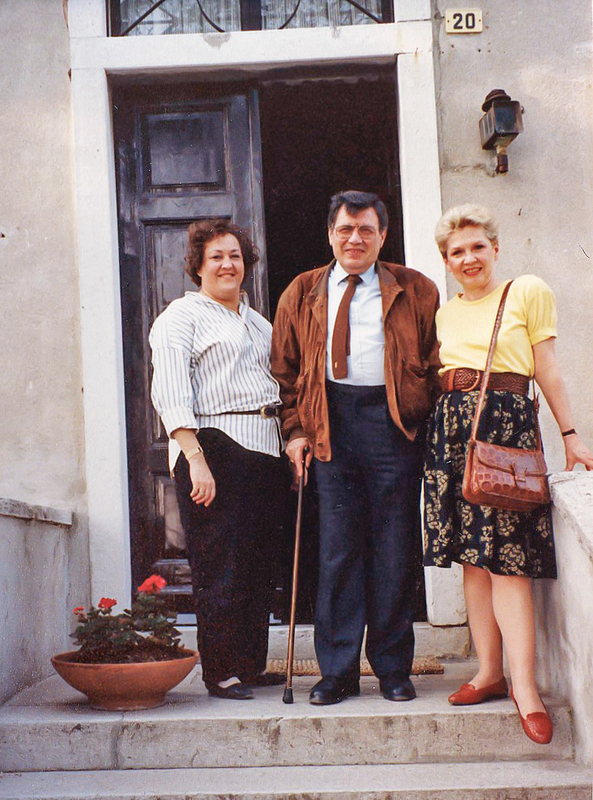 Milanese residents Paolo Volpara (original partner until 1986) and his mother, Wanda Bottino. They still remain the essence of Convito. 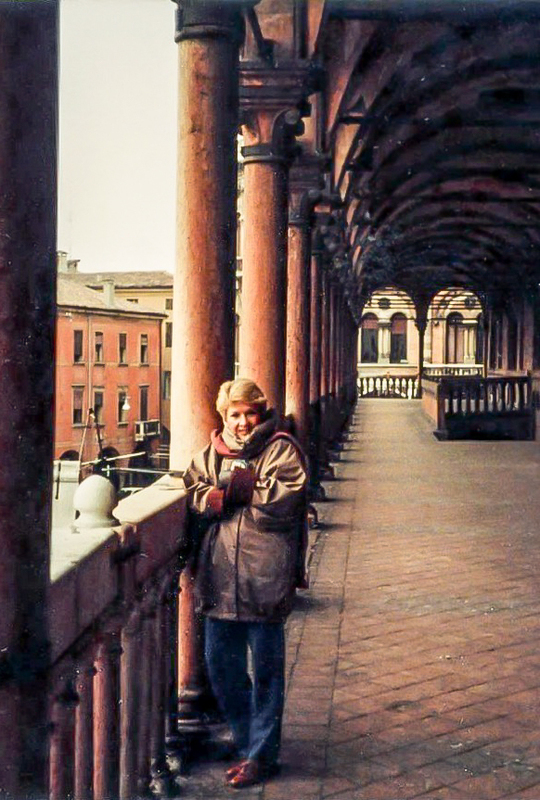 Milan is where it all began for me – where I learned about regional Italy – traveling with Paolo to all 20 regions and cooking the dishes of each region with Wanda. Colleen Houlahan (until 1990) GM in charge of operations and personnel. Leslee Reis – dear friend, owner of acclaimed restaurant Café Provencal who advised me on all things culinary. Maury Ross, president of the Wine House at Union Liquor who became my trusted wine advisor. Violet Caldarelli – first Convito chef, catering director and master of customer service. Karen Brussat Butler – sister and exceptional water colorist who provided the “Convito look”. The answer to why I came to this particular part of the world was easy. Family. 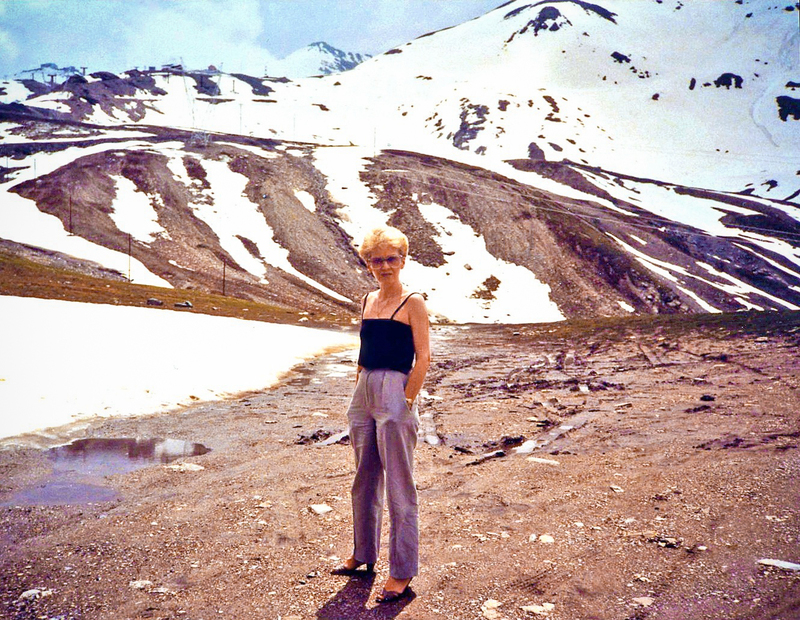 It seemed only logical that the best place to share the feelings I have about food and its powerful and physical connection to a family’s story and traditions was Italy, the country responsible for crystallizing that awareness in me. Italy is a country that understands implicitly that enjoyment of an evening at the dinner table is more than just the mere ingestion of food. Food actually tastes better when accompanied by story telling, laughter, problem solving or just the simple act of reviewing the events of the day. For two years I had been planning for this moment – the idea coming one sunny afternoon when my 8-year-old granddaughter Neko and I were prepping ingredients for a pasta sauce we would serve for dinner that evening. She loves helping with all aspects of the meal. She was especially curious about Italy and my connection to it. “Where did you go? Who did you meet?” she asked. At one point, she looked up at me with those big brown warm eyes and said, “I wish I could go to Italy with you someday Grammy!” Well, that was all I needed. What could a Grammy do? Immediately I began planning a ten-day sojourn to Italy with my son and daughter Rob and Candace and their spouses Angie and Rob W. and all four grandchildren: Rob and Angie’s Neko and Isis; and Candace and Rob’s Kingston and Kianna. This adventure would be an opportunity to share my 35-year “Italian Experience” with all of them. My four grandchildren loved eating pasta in the café and selecting candy from the market for their dessert. That was one kind of experience. But going to the country that inspired all that good food and wine was another. It would only enrich their Convito experience, I thought. As with most young working couples, finding a time mutually agreeable to everyone was difficult. Once accomplished I began the fun part – formulating a plan that would be both interesting and enjoyable to a group whose ages spanned almost 5 decades – the youngest (Isis) only 4 years old. Certainly the eating and drinking would play a large role in our travels, but my love affair with this country involved more than just my affinity for its food and wine (although that was a major part of the attraction!). The friendships I had formed over the years – as well as relationships with various Italian companies and wineries – rounded out and enhanced my experience. What better way, I thought, to begin our journey then a visit with the Lazzaronis, a family whose friendship dates back 30 years. My original connection with this famous biscuit family (Amaretti di Saronno) began in 1985 in the middle of a raging snowstorm in a nearly deserted Milanese restaurant. Talking with one of the few remaining patrons, I soon realized it was none other than Luigi (Gigi) Lazzaroni. After establishing the fact that I owned an Italian market that carried his products, Luigi insisted I visit his factory in Saronno. “Come tomorrow,” he said. “Do you think that’s possible?” I responded pointing to the accumulating snow outside. Predictions for the storm’s continuing intensity were pretty dire. Unfazed by the elements and true to his word, I awoke the next morning surprised to find a car with chains on its tires waiting for me outside my hotel. Still snowing fiercely, the driver maneuvered me through the messy streets of Milan slipping and sliding all the way to Saronno where I met Luigi for a fascinating and informative tour of the factory and the Lazzaroni archive room housed in the 15th century monastery where he lived. Afterwards we had a lovely dinner in his quarters. That very memorable day began what was a long and very rewarding friendship. (Luigi passed away several years ago but I have kept in touch with many other members of his family). So here we were about to begin our journey at the very same 15th century monastery I had visited some 30 years earlier. Our visit this time was for breakfast with Luigi’s brother, Paolo and Paolo’s son, Luca. After a warm greeting we entered the lovely dining room. Several Lazzaroni family members occupy this beautiful, historic old building – each with their own quarters. Both Luca and Paolo and their families live here. The table was set with inviting platters of fruit, pastries and meats and cheeses. As Patriarch Paolo answered our many questions about the history of the Lazzaroni company (founded in 1888) and the family itself, he abruptly interrupted himself as he noticed that the slices of mozzarella on the platter of meats were still wrapped in cellophane. “Mi scusi,” he lamented. “You can tell that the men put this breakfast together (the wives were away on vacation) – the cheese is still dressed!” We all had a good laugh. After a delicious breakfast, the adults adjourned to the archive room while the children went for a swim in the outside pool. Seeing all those vintage boxes and tins brought me back to my visit 30 years ago when I first came to appreciate the genius this company had for design and marketing not to mention the quality of their products. It continues to this day. Convito still proudly carries Lazzaroni panettones and boxed Amaretti as well as an assortment of Lazzaroni biscotti. My daughter and partner Candace is now the buyer. Her contact is Luca Lazzaroni and it is my hope that the two of them continue this warm and rewarding friendship. On the road again! Son Rob became the sole autisa (driver) for the duration of our trip maneuvering our huge white van through the highways, narrow streets and small villages of Italy with great confidence and agility. He seemed to be unfazed by the aggressive drivers on the autostrada and laughingly enjoyed the tollbooth salutation “Arrevederci” blasted loudly on a speaker after each toll was paid. Responding with his own equally loud and dramatic “Arrevederci”, we all eventually joined the fun and added our voices to this Italian farewell rocking the van with much good humor. “Arrevederci” screamed loudly became THE Italian codeword of our trip. Two hours later we turned onto the long olive-tree-lined drive at the end of which stood our welcoming soft pink-stucco villa perched imposingly on a hill overlooking Lake Garda. Green rolling pathways led to various areas of the property. We explored them all while waiting for the villa’s owner to arrive and give us the grand tour of the inside of Villa Costasanti. On one side of the property was a vegetable garden overflowing with an abundance of produce just waiting to be picked. Next to the garden was a grove of more silver leaved olive trees laden with ripening green olives. Adjacent and flowing over the hillside was row upon row of vines dripping with clusters of lush grapes readying themselves for the impending harvest. And then came the most important pathway for the grandchildren – the one that led down the stairway from the terrace to a handsome and inviting blue tiled pool. The property was rich with the foliage so typical of Veneto – majestic cypress trees, pink blossoming oleander shrubs and a variety of other bushes and flowering plants all adding to the beauty of this soft, lovely region. Lorenzo Boscaini, owner of the villa, arrived to welcome us. Armed with information, brochures and an assortment of treats from a local bakery, he gave us a tour of all the beautifully appointed rooms inside the villa. We most certainly had hit the jackpot! This was going to be a glorious week! After two days of travel, we decided to unwind and enjoy our first meal at a local trattoria recommended by Lorenzo. Trattoria Villa was a charming little restaurant overlooking the rolling hills of Lake Garda, where we sat outside enjoying the soothing warm breezes of summer and happily allowing our travel anxiety to slowly slip away. As the sun set the sky filled with twinkly stars. A sliver of a half moon hung plaintively above our table. Many of our warm family moments that week coalesced around a dining table – sometimes on our terrace, sometimes at a pizzeria, sometimes at a restaurant. The long rectangular table on our terrace provided us with a whole range of eating experiences – casual breakfasts of fresh fruit and Italian pastries, equally casual lunches of savory antipasti – comprised of salamis and prosciutto (freshly sliced on our very own meat slicer), cheeses and vegetables from the garden – and more elaborate evening meals – some we cooked together – others cooked by a private chef arranged and orchestrated by our host, owner Lorenzo Boscaini. My best-loved meals were those cooked by the family. The cliché that “a family that cooks together stays together” – though corny – has a certain ring or truth for me. There is a magical camaraderie that prevails when each member of the family participates in a meal. Whether it’s filling the water glasses, stirring the risotto, washing the lettuce or just lighting the candles before everyone is seated, participation brings everyone together and prepares them for the meal at hand. My son (who is an excellent cook) and I have spent many unrushed meaningful moments together in the kitchen. Focusing on the task of cooking somehow allows conversation to flow in a more organic way – especially with children. Maybe it’s because the food is the focus – not them and answering questions in this setting doesn’t feel as much like an interrogation. These are some of my favorite moments with my kids and their grandchildren. Our first full day in the villa was one of relaxation, getting organized and discussing plans for the week. I decided I would cook that night putting together a meal from groceries we had purchased on our way to the villa and vegetables from the villa’s garden. After a leisurely breakfast I made my way to the garden accompanied enthusiastically by Neko and Kianna – always anxious to help. Tomatoes were sprouting from every vine just waiting to be plucked – juicy looking Plum and Roma tomatoes and an assortment of yellow and red grape and cherry tomatoes. Neko and Kianna scurried between the vines hunting for the best, the plumpest – the ripest – and placed them in our garden basket. Kianna also collected some fresh basil leaves and Neko pulled a few red onions from the soil. Perfect ingredients, I thought, for a fresh, barely cooked summer pasta sauce, one of my favorite summer meals. “We like picking tomatoes,” Kianna said. “But we don’t like eating them!” “It’s those yucky seeds!” Neko added. I quickly rethought my evening meal. I guess my barely-cooked-fresh-tomato sauce with the “yucky seeds” would have to be just for the adults. I would make another sauce for the grandchildren. As planned everyone participated in the meal that evening. My son, Rob and my son-in-law – “the other Rob” acted as prep cooks. The main course for dinner was spaghetti with the “adult” fresh tomato sauce and penne with Amatriciana (a tomato pancetta sauce) for the grandchildren. Tomatoes from a can were somehow far less threatening to them. Our spaghetti dish was the very essence of Italian simplicity and seasonality – something the Italians had been doing for years. Because it was our first evening meal at the villa and the ingredients for the most part came from Lorenzo’s garden as well as using olive oil from the property, I have named it “Spaghetti alla Villa Costasanti”. parmesan cheese – freshly grated. Eating was not the only item on our agenda. Sightseeing was another. Verona – just 30 minutes from our villa – was our first adventure – an experiment to see how the youngest of the grandchildren would endure. It was a test for the upcoming day trip to Venice – two plus hours away and not necessarily an easy city for a four year old to maneuver. After thirty minutes of standing in line to visit the Roman amphitheatre (security slows everything down these days) and much stair climbing and admiring of ancient history, (not very impressive when you’re 4) Isis near tears famously asked her father, “Why do we have to go up and down and up and down so much, Daddy?” How does one argue that case to one so young? However, eventually there was a Verona highlight for Isis – a pasta lunch in Piazza delle Erbe (Verona’s most famous town square – the former forum during the Roman Empire) and a trip to the market where she very decisively selected a little wooden Pinocchio as her souvenir purchase. One of the highlights for all of the grandchildren – actually for all of us -in all of the cities and villages we visited – was a stop at the local gelateria. Italian ice cream is divine and what better way to end a meal. Chef Mauro Buffo and Chef Christian Montoli prepared many delicious courses that evening but my favorite was their simplest, Pinzimonio. Pinzimonio is raw vegetables with a simple dip, a Tuscan tradition that dates back to the Renaissance. Back then elegant formal meals and banquets featuring amazing grand centerpieces of raw vegetables were eaten at the beginning or ending of a meal. So decadent! Ours was not as decadent but I’m sure just as delicious. Emulsifying a combination of Extra Virgin Olive Oil, cider vinegar and Dijon mustard made this particular dip an absolutely perfect partner to the bowls of raw vegetables beautifully arranged on a table Lorenzo had set up to the side of the terrace. My choice of Veneto as our Italian destination turned out to be an excellent one. I wanted so much to give my grandchildren the flavor of Italy without taxing their developing “sightseeing” skills. Short lakeside visits were most popular. The villages of Lazise and Bardolina were both close by and gave us our “sense” of Italy with plenty of time to get back to the villa for a swim in the pool. Delightful narrow streets lined with quaint little shops and lovely lakeside promenades offered an abundance of Italian charm and character. We usually enjoyed a simple lunch – salad, pizza or a bowl of pasta – at a one of the village cafés. Venice remained on the agenda as the next big sightseeing venture but based on our Verona experience, it was decided that Isis and I would remain at the villa. The “ups and downs” of Verona convinced her that she would give Mommy and Daddy up for a day. Playing with Grammy was preferable. While the seven of them spent a very hot day exploring the canals, the intimate pathways and the exotic beauty of Venice, Isis and I had a jam-packed day of art projects, coloring, swimming and movie watching. The teacher in me even managed to fit in a “botanical” lesson. We walked around the property collecting examples of the foliage. Later we pressed them between two pieces of wax paper as remembrances of Veneto and our lovely villa. It was rare for me to make a trip to Italy without visiting a winemaker – very much a part of my “Italian Experience”. However, visiting a vineyard with children and participating in a tasting after a tour of the vineyards would not be appropriate. Since I already had the good fortune to visit the Masi winery on two different occasions and the owner, Sandro Boscaini, had visited Convito several times, I arranged for a tour and a tasting for the four adults while I stayed back at the villa with the grandchildren. Masi is one of Convito’s favorite wine producers. We carry many of their fine wines and have since we opened 35 years ago. (see blog – Veneto I – “Fashion and Passion in Veneto”) Candace now oversees the wine buying at Convito so she was anxious to review the wines we now carry as well as to taste any new selections they might have. While the four of them spent a good part of the afternoon at Masi and Serego Alighieri (a prestigious Amarone winery affiliated with Masi), I spent a very enjoyable afternoon with my grandchildren. The adults were learning all about the nuances of several new Masi wines while I was learning the nuances of the Kid’s Club formed just days ago by my four precocious grandchildren. Not only did they inform me of their clandestine activities but they also told me the Kid’s Club password revealed only to members. I was, of course, honored but sworn to secrecy! My focus when I travel to Italy is always regional. I like to drink the regional wine and taste the regional dishes. So, of course, I wanted to cook at least one regional dish for one of our evening meals. That kind of diversity has always been reflected on our restaurant menus. I decided upon risotto with radicchio, a typical dish of the Veneto. In my version I added pancetta and toasted pinenuts. Son-in-law Rob resumed his roll as prep cook readying all the vegetables for the risotto and the salad while son Rob and I shared cooking duties. Co-chefs I guess you could call us. Candace formed a front-of-the-house labor force comprised of Isis, Neko and Kianna. They set the table, poured the water, took drink orders and sliced the bread placing it into a breadbasket on the table. Neko and Kianna then assembled one of Angie’s favorite Italian dishes, Caprese – arranging alternate slices of fresh tomatoes and mozzarella on a ceramic platter finishing with a drizzle of the villa’s extra virgin olive oil and fresh julienned basil. Kingston assumed the role of official “risotto stirrer”. As I added the simmering broth, Kingston made certain each cup was incorporated into the rice before adding another (the secret to art of making a good risotto). I used Carnaroli, rice that has a larger grain than Arborio (the rice most commonly used in risotto). Referred to as the “caviar of rice” it produces a deliciously creamy but firm risotto. The addition of radicchio makes for a delicious risotto. Radicchio, sometimes known as Italian chicory has a slightly bitter, spicy taste. It was cultivated sometime in the fifteenth century in the Veneto region but research indicates that a form of red chicory with white veins was also grown as far back as ancient Egypt. While we were all performing our duties, Rob opened a bottle of Masi Oseleta he had purchased at the winery that afternoon. What a great scene I thought – the whole family working together, laughing and conversing about the events of the day. It was a scene I would not soon forget – deserving of a toast with this wonderful Masi selection. In a saucepan, bring the vegetable broth to a steady simmer. Melt the butter with the olive oil in a heavy-bottomed skillet over low heat. Add the shallots and pancetta and sauté over medium heat until shallots are soft and pancetta is somewhat crisp. Add the rice and stir until well coated. Add the wine and stir until absorbed. Begin adding the simmering broth ½ cup at a time. Continue stir cooking always making certain the rice is not sticking to the bottom of the pan and yet not adding too much broth at a time. This process should be done over medium heat. (Approximate cooking time is 30 minutes) About 20 minutes into the process, add the radicchio and stir into the rice. Continue adding broth. The rice is done when it is firm but tender. You may need more broth or if you run out, use hot water. When you estimate that the dish is a few minutes away from being done, turn off the heat. Add the Parmesan, stirring it into the rice. You may want to add another tablespoon of butter. Taste for salt and pepper. Serve in individual bowls immediately. Food and its connection to family and traditions was beginning to resonate in my grandchildren’s lives. I can still remember the moment that feeling began to resonate with me. I was around 12 and preparing a submarine sandwich for a family lunch piled high with meats, cheeses, pickles, tomatoes and lettuce. They were delighted. It wasn’t anything out of the ordinary but they acted like I had done something extraordinary – especially my dad who lovingly dubbed it the “Nancy Sandwich”. It was then I realized that food could not only satisfy hunger but could also be a source of comfort and pleasure. From that point forward my dad encouraged my love of food and always sought to make food and family traditions a priority. I was happy that I might be playing a role in that discovery with my four adorable grandchildren. For that alone this trip was worth it! Our “Italian Experience” was coming to an end. Dinner our last night at the villa was once again orchestrated by Lorenzo and his private chefs. We could sit back, relax and enjoy our last moments in this magical place. I contentedly watched the interplay of the children, the camaraderie of the whole group, the setting of yet another table around which we would all eat and drink well and converse about our lives and our wonderful sojourn to this wonderful country. It was all just as I imagined it back when Neko commented, “I wish I could go to Italy with you someday, Grammy!” And here we were! We did not fly back to the U.S. the next day as planned. Our flight was cancelled. So we scurried around making new plane reservations and decided to spend our “extra day” in Stresa, a town on Lago Maggiore (see blog Lake District II “One Grand Package” ) close to our hotel. Frustrating, as it is to have a flight cancelled, Stresa and Lago Maggiore and Isola Bella made the pain easy to swallow. And the “Crazy Pub” where we ate both nights (next to the hotel) was also a bonus. Good food (you could have anything from a hot dog to a good bowl of pasta) and an amazing selection of beer – was such fun. We decided we wanted to return again one day – maybe for our next trip! The enjoyment of a good glass of wine was a part of my evening ritual long before I opened Convito. But beyond giving a bottle the thumbs up or thumbs down, I was unequipped to assess the more sophisticated components of the wine I was drinking. Terms like legs, nose, suppleness and mouthfeel were not a part of my vocabulary. That is, until I decided to open an Italian market in 1980. The original goal behind my opening of Convito was to create a high quality Italian marketplace where Americans would have access to some of the more hard-to-get Italian foodstuffs that I had the luxury of being exposed to while living in Europe in the late 70’s. I wanted a small shop that featured a curated selection of all the essential elements of the Italian meal, one that imparted the many aspects of Italian cuisine and culture that I continued to acquire during my regional journeys. And since to the Italian people wine is culture; the inclusion of a small but fine selection of wine was an obligation. When Convito first opened its doors, Italian wine had yet to be discovered in the Chicagoland area. Other than a couple of Chiantis, Verdicchio, Frascati, Asti Spumante and an occasional Barolo, good Italian wine was almost impossible to find. My partners and I wanted to change that. Although it was not my intention to become a wine expert, I decided early on that I couldn’t very well fill my shelves with fine Italian wine and not at least be familiar with the secrets inside all those beautiful bottles. The teacher in me wouldn’t allow that. So I began my self-guided wine education by attending a series of tastings and classes sponsored by the area’s wine sales and marketing companies and occasionally – when I was lucky – by the wine producers themselves. Generally, these were huge events with upwards of 50 wines for retailers and restaurateurs to taste; way too many I thought for any palate to adequately process and intended more for local buyers who already possessed a more formal wine education than I did. But I faked my way through them and quickly taught myself the basics of the proper way to taste wine and which varieties most appealed to my particular taste. As I made my way through these events, I became aware of some of the smaller and more intimate formats that became my preference. I also realized that my favorite learning experience came in the privacy of my own home where nightly I would uncork a bottle from Convito’s wine selection and enjoy it over dinner with my then husband Bob. We swirled and sipped capably, but we also auditioned many of the other professional wine tasting techniques I was now attempting to add to my repertoire. It was so much easier assessing a wine when there was only one wine to assess, and it was so much more enjoyable. “Somebody has to do it!” Bob would wryly comment. As I made the transition from a neophyte student of wine to a practiced taster, I started to parlay Convito’s growing reputation beyond Chicago to gain access to what I found to be the best classrooms of all, the wineries themselves. A walk through a vineyard, a tour of a wine cellar or simply enjoying a glass of local wine with one of the typical foods of the region while actually being in that region, were unparalleled learning experiences. And when I was lucky enough to visit one of those vineyards accompanied by the winemaker himself, that was the ultimate classroom. As with so much of my Italian education, Lombardia was the region where it all began. Milan, the region’s capital was home to my partners, Paolo Volpara and Wanda Bottino and was my own particular headquarters for studying Italian history and culture, recipe testing and planning our itineraries for regional exploration. 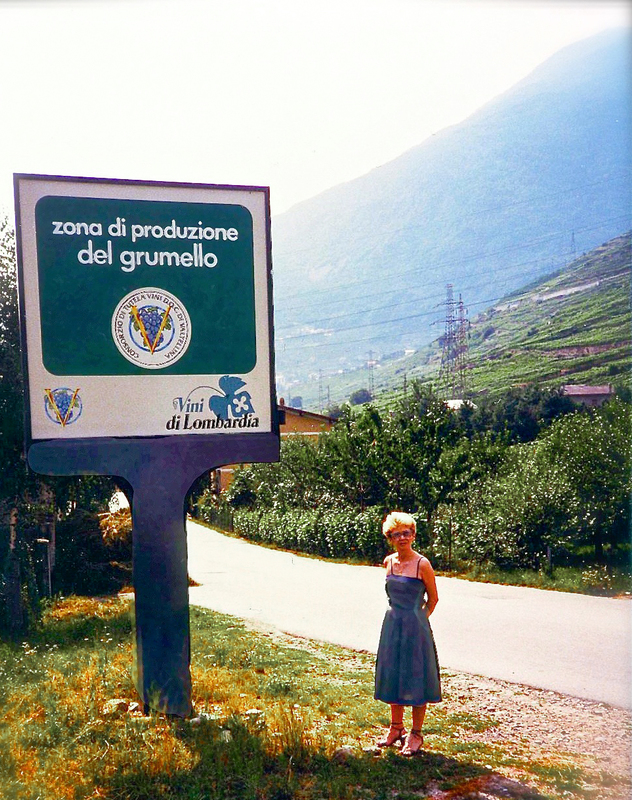 Exploring Valtellina in 1981 was my first venture into Lombardian wine territory – and a complete surprise. An alpine valley in northern Lombardia close to the border of Switzerland, it is considered one of the most dramatic and at the time one of the most unexplored wine regions in all of Italy. It was amazing to me that an area so close to the hustle and bustle of Milan could feel so remote and look so different. I could never get used to (but always loved) the short distances one has to travel in Europe to see such a completely different picture of the world. In the Midwest – where I have lived most of my life – it was necessary to travel miles and miles before having such an experience. Images of light and shadow dominated our journey. The region’s mountain ranges – the Bernia Alps, the Ortles Mountains and the Orobie Alps – provided a variety of different sights along the way. Some mountain tops were capped with snow, others grey and foreboding, and others naked and bluish, blending with the sky above. All of them loomed over wide stretches of soft, lush green valleys sweetly dotted with charming chalets and churches. Higher up, the mountains were covered with tall, pointed majestic pines stretching upwards to the heavens appearing as nature’s own Gothic Cathedral. We climbed to the Stelvio Pass, the highest paved mountain pass in the Eastern Alps. The view was breathtaking. Snow still lingered from the winter and the air was crisp and cold even in July. Further south, approaching Sondrio, the mountains became tamer with vineyards lacing the slopes. The valley runs east/west following the Adda River, whose waters over the centuries have dug deep into the area’s hard granite. Paolo commented that only a few other Italian wine regions could match this dramatic vineyard landscape; the sheer cliffs of Cinque Terre and the breathtaking Amalfi Coast being its only equal. Small streams traced intricate patterns down the sides of the mountains and a thundering river pounded onto hard rocks spraying mist high into the sky. Along the way elegant taupe-colored cows could be seen contentedly grazing on the steep hillside while a group of chamois waited patiently for intruding cars to pass before crossing the road. It was all so idyllic and fairytale-like. The terraced vineyards of this area are quite spectacular. It is hard to imagine how difficult it must be to harvest the grapes on these steep man-made terraces. A year and a half into learning about wine, I was still a novice, but familiar with the area’s principal grape varietal, the Nebbiolo, one of Italy’s most famous grapes known primarily in the Piemonte region as the source of the world famous Barolos and Barbarescos. Here, however the grape is called Chiavennasca, named after the nearby town of Chiavenna. I was anxious after our long first day to enjoy a glass of the area’s wine. On our first evening we had dinner in a restaurant in Morbegno, a little town in the lower part of the valley running alongside the Adda River, a tributary of the Po. Looking at the menu I understood quickly that there was no question what ingredient would dominate our dinner. This was mushroom country. The very finest and sought after porcini mushrooms are the Boletus eduli grown here in abundance under the pine trees. 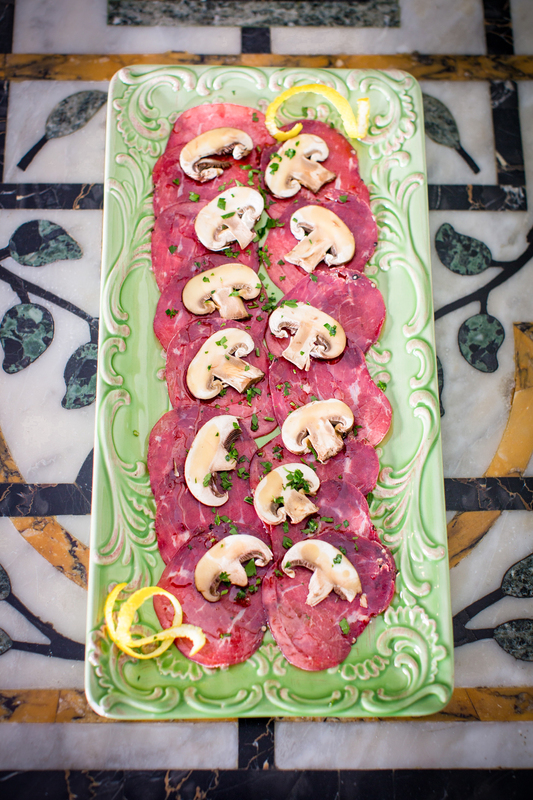 “Valtellina is one area of the world where mushrooms are not a luxury – they are an everyday staple,” Paolo commented. When we asked our waiter what wines went with the mushroom-dominated meal we were about to order, he was happy to describe pretty much all the wines of the region. “Valtellina wines go perfectly with all the hearty mountain foods of this area – including the mushrooms,” he said. “These Nebbiolo wines are more muscular than the Nebbiolo wines of Piemonte. They tend to be less tannic, earthier and more graceful – intriguing food wines.” Seducente (seductive)” he called them. I loved that description. We ordered a recommended glass of Sassella, the wine he considered to be of the highest quality on their wine list. It was certainly lighter in body and less powerful than any Barolo or Barbaresco I had tasted and went well with the many mushroom courses we had that evening including a mushroom risotto; a huge steak-like grilled mushroom, its tawny cap brushed with olive oil and herbs; and my favorite course – an iconic dish of the region – bresaola topped with paper thin slices of mushrooms, chopped parsley, a drizzle of peppery Tuscan extra virgin olive oil and freshly squeezed lemon juice. Bresaola is air-dried salted beef that is aged for two to three months eventually turning a dark red color. The meat comes from the top round of the cow, but in Valtellina, sometimes deer is used instead of beef. Originating in this area, bresaola is now becoming a popular dish in several countries around the world including the U.S. Its sweet taste goes perfectly with the porcini of the area. 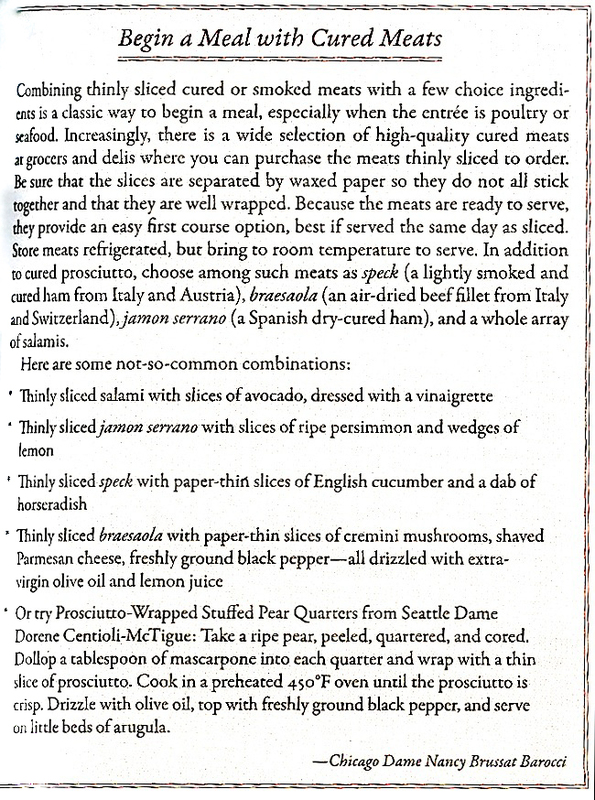 Following is a piece I wrote for The Les Dames d’Escoffier International cookbook entitled “Begin a Meal with Cured Meats.” Any of these meats make for wonderful first courses – or on a summer night, the main course accompanied by some delicious crusty bread and a good glass of wine. Our last night in Valtellina we had another fantastic meal in Grosio, a town just northeast of Sondrio close to the border of Switzerland. Pizzoccheri, flat-ribbon pasta made with buckwheat flour and wheat flour is another regional classic. It is the name of the actual pasta as well as the name of the dish. The dish also includes potatoes and either Swiss Card or Savoy or Napa cabbage, Valtellina Casera cheese (very similar to Fontina which is more readily found in the United States) garlic and sage. Pizzoccheri’s ancient origins supposedly go back to 1550. It is not colorful but hearty and full of flavor – especially good on a cold winter night. We enjoyed our Pizzoccheri with a glass of Valtellina Superiore Grumello another wine made with the Nebbiolo grape. Medium-bodied and earthy, it was excellent with our meal. I was beginning to recognize on my own how certain wines went well with certain foods – enhancing one other. This was the case with our Grumello. The waiter also offered us a taste of another famous local wine – Sforzato di Valtellina, a passito wine (those made from dried grapes). While many passito wines are sweet, this one was dry, full-bodied and rich – and also went very well with our “mountain dish.” Another lovely match! This whole food and wine pairing process was beginning to be fun – much less intimidating than when I first began to seriously taste wine. Bring a large part of water to a boil. In the meantime melt the butter over low heat in a small sauté pan. Add the garlic and the sage and sauté until the butter turns a nut-brown being careful not to burn. Set aside. The sage leaves will be crispy. When the water has come to a boil add the potatoes, cabbage and pizzoccheri noodles and boil for about 12 – 15 minutes until noodles are al dente. Drain well. Remove garlic from melted browned butter and discard. Remove sage leaves from butter and crumble. In a large ovenproof casserole dish, spread a layer of the pasta vegetable mixture, then a layer of fontina, then a layer of parmesan. Sprinkle with salt and pepper and drizzle with 1 ½ tablespoons of melted butter. Repeat 3 more times. 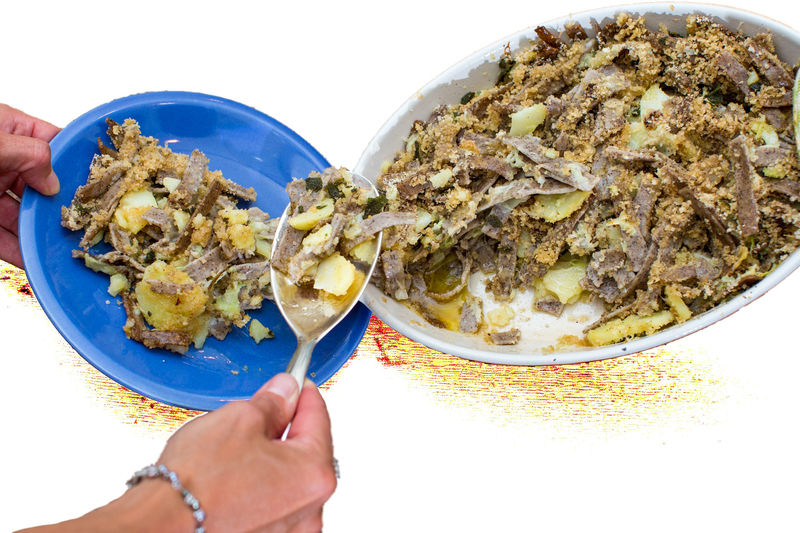 Cover with breadcrumbs and drizzle with the remainder of the butter and the crumbled sage leaves. Bake for about 15 – 29 minutes until the breadcrumbs are golden brown and cheese has melted. Serve. Tasting wine is an art – an art that requires focus and concentration. I couldn’t call myself an expert yet, but I was beginning to feel more comfortable with the formal tasting steps required for evaluating a wine and was beginning to be able to identify and assess the sometimes very subtle differences between even very similar wines. But I still felt that the whole process was somewhat pretentious and wanted to find a way to make the experience of wine tasting more accessible. During a trip to Paris with my friend and fellow restaurateur Leslee Reis we discovered a very whimsical wine menu at a cozy little wine bar called L’Ecluse that happened to be close to our hotel. Cartoon-like characters illustrated the steps of wine tasting in a very humorous way. Something clicked with both of us. Leslee suggested a similar format might be perfect for Convito’s new wine bar, restaurant and market to be opened in downtown Chicago in 1984. Upon my return I commissioned my award-winning artist sister Karen to paint six of her fanciful characters to depict the 6 stages of wine tasting: seeing, swirling, smelling, sipping, savoring and summarizing. My business partner’s husband, English Professor Mike Houlahan, wrote the copy. This was such a fun project. Karen actually raided my closet in search of Italian clothes to dress her six characters in. The “See” lady is wearing a Missoni dress I owned and the “Smell”, “Sip” and “Summarize” men all donned Italian ties from my husband’s tie collection. The project was hugely successful. We printed 2,000 covers to encase our wine list and Karen sold the original gyclée prints on her website. We expected these jackets to last two years but because they were so admired, many of them sneakily disappeared into the purses and pockets of our customers and walked out the restaurant doors. There was something about this particular project that changed things for me. I don’t know if it was that it simply coincided with a newfound confidence I had gained in understanding wines and the process of tasting them or the fact that I was now contributing to the education of others, but it was about this time when I began to really have fun tasting wine! The project stimulated much discussion – sometimes silly – with my sister and motivated continued exploration. On our next trip to another of Lombardia’s wine districts we visited the Franciacorta District and met with one of its masters, Maurizio Zanella of the Ca’ del Bosco winery. Located just east of Milan between Brescia, Lake Garda and Trento, Franciacorta is the name of both the geographic area and of the wine itself. It is a wine often compared to Champagne because like that sparkling wine, Franciacorta achieves its effervescence due to secondary fermentation in the bottle (the classic method) and is also like Champagne in that it is limited to a geographic area. However, Franciacorta is a smaller area with a much lower production, which – in my mind – made it all the more exceptional. We met Maurizio and his wife Tizziana at Ambasciata, a restaurant in the province of Mantua. Our meal was splendid as was the restaurant’s very striking interior. It never fails that having dinner with a winemaker is always the best of dining experiences. Restaurateurs love and appreciate winemakers and winemakers love and appreciate restaurateurs – especially if they are good. And this one was excellent. Maurizio is a dynamic person. He talked about his many trips to Champagne and how that exposure provided inspiration to him and his winery. Our dinner was filled with interesting wine information – about his wines and about the area. Of course we began with a glass of Ca’ del Bosco Franciacorta Brut. Maurizio explained that this sparkling wine was made from carefully selected grapes (chardonnay, pinot blanc and pinot noir). A delightful wine – fresh, fragrant with a firm structure and richly alluring – it went beautifully with the many little tastes delivered by the chef to our table before our main meal even began. I especially remember a lovely small salad made of arugula, pear, candied pecans and the creamy Gorgonzola Dolcelatte* produced in the region. I was surprised how well the Franciacorta complimented the salad. Maurizio led us through the whole deliciously fantastic meal commenting on each course and how each wine matched that particular food. 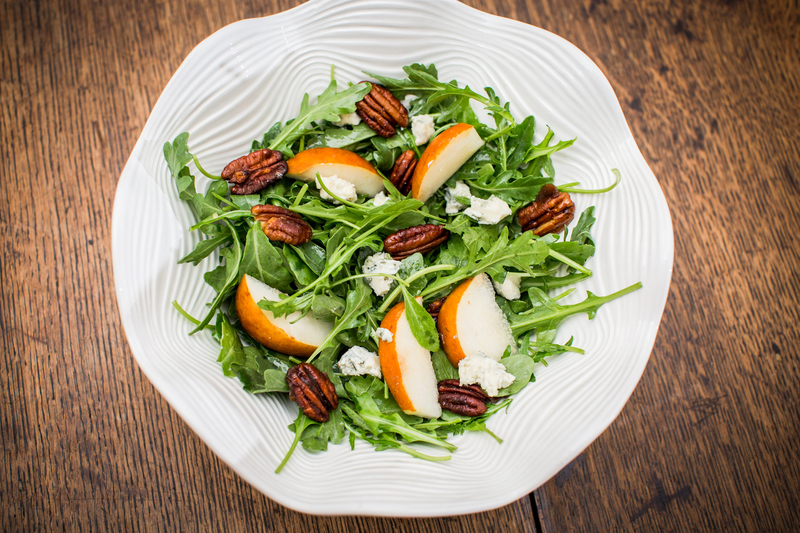 The spiciness of the arugula and the creaminess of the cheese as well as the lightly sugared pecans and the slices of pear all blended together perfectly. And the sparkling wine was a beautiful match. Melt the butter in a small sauté pan. Add pecans and toss with butter. Sprinkle with sugar and stir until caramelized. Spread on wax paper and cool. Combine ingredients for dressing and set aside. Over dinner we discussed Karen’s wine tasting series. They had been printed in the Wine Spectator in 1988 so Maurizio and his wife were aware of them and thought the six characters were charming. After a spectacular dinner we accompanied Maurizio and his wife back to their winery and stayed the night. In the morning before a visit to the vineyards and wine cellar we joined the family – Maurizio, Tizianna and their adorable son Brando – for a croissant and a latte. As expected their home and their winery was extremely handsome filled with beautiful art and amazing sculpture. Walking through the vineyards, Maurizio recalled Ca’ del Bosco’s history beginning in 1968 when they started planning their very first vineyards. His mother purchased the land (Ca’ del Bosco means ‘House in the Woods’) in 1965 and since then it has grown both in size and reputation. Ca’del Bosco wines are celebrated everywhere in the world as is the man himself. President of the Franciacorta consortium, he is considered one of the area’s pioneers and main spokesperson. Since our visit in 1988 I have read about Maurizio and the many awards and honors he has accumulated. He has also introduced many new wines including a red bearing its creator’s signature – Maurizio Zanella – as well as a Franciacorta dedicated to his mother Annamaria Clementi, founder of Ca’ del Bosco. The Cuvee Annamaria Clementi is considered one of the great wines of Lombardia. Not only has Maurizio Zanella accumulated awards but also his art collection has grown exponentially. Major works of art can be seen all over the property. Currently a group of large blue plastic wolves rule over the roof, a life-size white rhinoceros hangs suspended in the crush pad and a handsome bronze sculpture by Arnaldo Pomodoro entitled “Hymn to the Sun” welcomes visitors to the estate. By the time I visited another of Franciacorta’s renowned sparkling wine estates in 1999, I had become as proficient in the art of wine tasting as I would ever be (though I was still a little sloppy when it came to the swirling part!). Still not on the level of a true sommelier (and I never will be), I was very knowledgeable about Italian wine, comfortable with tasting in any circumstance and thoroughly enamored of the whole learning process. The aging of wine is meant to improve the quality of many wines and I, through the years, felt that my visits to the vineyards and focused tasting of all the wines Italy had to offer, that I was beginning to (when it came to wine) “age well” myself – and to appreciate and understand the significant mystique of wine. The wine term “maturation” comes to mind when describing my evolving tasting experience. A much better term than “aging”. Bellavista was the winery we visited. Our hostess was Maria Empson, wife and partner of Neil Empson, premier wine importers. (see blog Milano III) Bellavista (Beautiful View) was named because of its magnificent position on a hill overlooking lovely rolling vineyards with views stretching from the Po plain to Lake Iseo all the way to the Alps and beyond. Our group consisted of very enthusiastic wine drinkers, all of us especially looking forward to tasting the Bellavista Gran Cuvee Brut Rose, which I listed as one of my favorite wines in an article in the American Airlines’ magazine. Before visiting the winery, Maria treated us to a fantastic multi-course lunch at the exquisite Gualtiero Marchesi Restaurant in Erbusco housed in the five-star hotel L’Alberta Relais & Chateaux owned by Vittorio Moretti, founder and owner of the Bellavista estate. Master Chef Marchesi is considered the founder of modern Italian cuisine. His restaurant in Milan won the distinction of a third Michelin star – the first chef in Italy to do so. As expected the meal was glorious. One of the courses reminded me of an appetizer that Convito had made for years (a Wanda Bottino invention) – a little crepe pinwheel filled with Mascarpone cheese, apple and walnuts then rolled into spirals. It goes beautifully with Franciacorta. Mascarpone comes from Lombardia. It is buttery, rich – a double-cream to triple-cream cow’s milk cheese. Since sparkling wine goes well with cheese that has a higher milk-fat content, this was a perfect match. After lunch we adjourned next door to the winery where we toured the gorgeous estate with the winemaker himself – Mattia Vezzola. Founded in 1977 this estate is made up of 100 different vineyard parcels. We certainly did not visit them all, but seeing the plump grapes (it was September and they were ready for harvest) weighing down the lush vines that undulated across the expanse of the beautiful rolling hillside certainly echoed the name of the vineyard – “Bellavista!” It was breathtaking! Afterwards we toured the cellar, then made our way to the splendid tasting room. And yes, everyone got to taste the Gran Cuvee Brut Rose and everyone loved it. We tasted several other wines as well. I, of course, followed “The Six Stages of Wine Tasting” (now a completely natural process to me). I was becoming an old pro at seeing, swirling, smelling, sipping – especially savoring but often when I reached the summarizing part I remained quiet and waited to hear from the expert in the room. In this instance, it was winemaker Mattia Vezzola. Who better?! Wine, I love it! At its best, a good wine exudes character and nuance. And in even the simplest of well-made wines there is a complexity that allows anyone – an expert or a neophyte – to find great joy in its tasting. In a book of wine quotes given to me by my mentor – the late Maury Ross (President of the Wine House at Union Liquor in the 70s and 80s) – one of my favorite quotes is from one of history’s most quotable figures, Benjamin Franklin. “Wine is constant proof that God loves us and loves to see us happy.” Amen to that! We had already walked for two hours on this bitter cold, dreary February morning wandering aimlessly from one dreary storefront to another, occasionally slipping inside to savor a bit of warmth. Why, I began to wonder, had I let Paolo talk us into accompanying him to Udine. It seemed like a good idea at the time; Wanda and I would do some research on one of the great cities of Friuli-Venezia Giulia while Paolo and his co-workers attended a client meeting in a nearby town. But as the cold minutes stretched into even colder hours I began to question my decision. Lunch couldn’t come soon enough. We had spent an hour wandering the streets looking for a cozy trattoria where we could enjoy one of the region’s hearty soups and a plate of local prosciutto, but we found nothing of the sort. Eventually we lowered our expectations and settled on a non-descript little café close to the corner where Paolo was to pick us up later in the day. Dreading any continued meanderings in the cold (it had begun to snow during our aimless ramblings), our intention was to extend the lunch “hour” for as long as possible. We lingered over an uninspired salad, a bowl of overcooked pasta slathered with a pedestrian tomato sauce, some less-than-fresh biscotti and lastly, espresso. Several espressos actually. “Davvero? Questo e Udine?” (Really? This is Udine? ), I asked Wanda, my voice dripping with disappointment recalling Paolo’s grand description of this city. “Credo di si (I think so)”, she responded sounding equally disappointed. Unfortunately this was before the ubiquity of cell phones and we had no idea if Paolo would be finished with his business meeting at the promised hour, so we didn’t want to wander too far away from our designated rendezvous. He eventually picked us up (late, of course) and while he and his two co-workers chatted excitedly about their successful client meeting all the way back to Milan, Wanda and I cuddled together in the toasty warmth in the back seat of the car, over-caffeinated from our multiple espressos at the restaurant, but happy to put our disappointing experience in Udine behind us. “I don’t remember exactly”, Paolo explained. “I dropped you off somewhere on the outskirts of the city. I just assumed that Wanda would have the good sense to take a taxi into the center. You mean you stayed in that area?” I should have trusted my gut instinct that told me Paolo would never have described that dreary ten-block radius as a part of one of Friuli’s grand cities. This Udine was exactly what I had been hoping to find those many months before. Though I still look back on that first visit to Udine (or the outskirts of Udine to be more accurate) as one of the great disaster of my Italy exploits, I was thrilled to have given it a second chance and to have discovered the real Udine. Six hours here – even in the cold – would have been easy! There was so much to absorb – the principal square (Piazza della Liberta) with its Venetian-Gothic style town hall (Loggia del Lionello) standing opposite the beautiful clock tower (Torre dell’Orologia) and all the many lovely gothic and Renaissance monuments near the center. We visited as many monuments as time allowed but as the beautiful alabaster clock in the center piazza chimed the approaching dinner hour, we were reminded of our reservation at Hotel Boschetti, a century old landmark in Tricesmino just outside the city owned by an old friend of Paolo’s. We planned to stay the night and dine in the hotel’s restaurant and Paolo promised we would be well cared for. He was absolutely right. After checking in, we settled in for a nine-course meal curated by his friend that included regional wines to accompany each dish. Among the many courses we tasted that night, I especially remember the gnocchi filled with plums. I had tasted my mother in law’s “plum dumplings” many years before at her Milwaukee home, and while those were a delicious example of Italian-American comfort food (Mary Barocci – formerly Mesich – was of Croatian ancestry, but her husband was an Italian who brought with him a tradition of Italian cooking by way of the mines in northern Wisconsin where his immigrant parents had settled – see blog Rome II “Where to Eat?”), these were altogether different. I had never quite understood the origin of this gnocchi – was it Italian or Croatian? Now traveling to Friuli-Venezia Giulia and understanding the proximity of Croatia to this region, it all made sense. Croatia was once a part of the Austro-Hungarian Empire as was Friulia-Venezia Giulia so the cuisine of this region – especially the eastern part – is highly influenced by Austria. Croatia Plum Dumplings are called Knedle s Sljivama and the Italian Plum Dumplings Gnocchi di Prugna. Testing this recipe was difficult for me mainly because despite the journals I kept for all my Italian trips, I didn’t really remember this very well and had no clear picture in my mind. I called my former sister-in-law (and still dear friend) Katherine Catalano for advice. Did she have her mother’s recipe? What did she recall? She, unfortunately, didn’t have her mother’s recipe but sent me one she thought was similar. She also sent me her “plum dumpling recollections”. “My mom’s plum dumplings were small – not big. 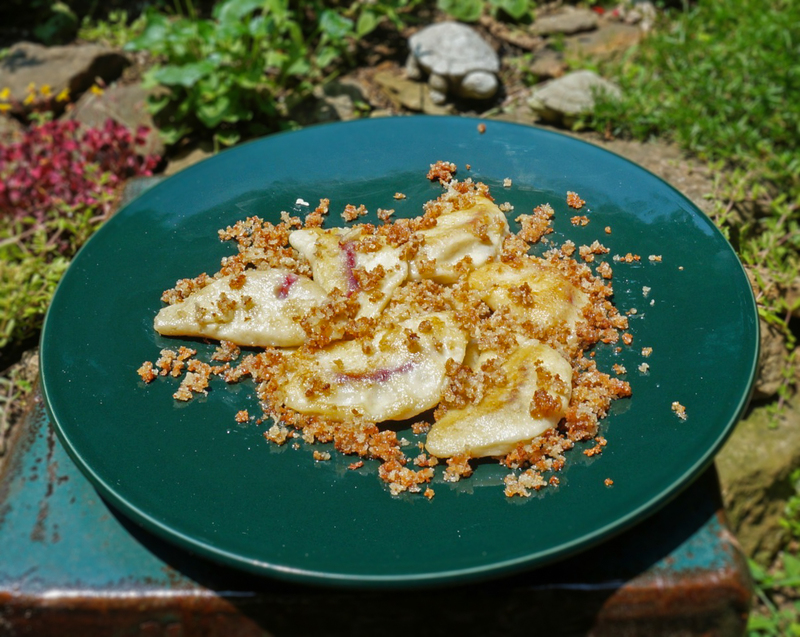 They sort of looked like little pierogis – crimped not rounded and wrapped around the plum section. I remember 5 or 6 on a plate. I don’t remember the sweetness as described in many recipes. She didn’t serve them as a dessert but as a side dish or a Friday night meatless supper. The crunch of the breadcrumbs outside, the chewy potato dough and the luscious juice that formed after cutting into them was what made them special.” Katherine also remembered that the dumplings were sautéed in butter after they had been boiled and then topped with buttered browned breadcrumbs. Keeping it in the family, I took this project to my sister Karen and her husband Jeff for testing – he a very precise person and she an excellent pie maker so the “crimping” would be easy for her. Jeff led the project. We all looked at several different recipes, made comments, read Katherine’s description and then began. By the end of our dumpling making project the kitchen was a total mess – flour everywhere especially on Jeff’s black shirt. We had lots of laughs and a great time! And most important, we thought the dumplings were delicious! I was especially relieved that I had a good recipe that hopefully was close to the dumplings I tasted all those many years ago! Peel and cut potatoes into 1” pieces. Boil the potatoes in a large pot of salted water until tender. Then mash or put them through a potato ricer. Place plum on one side of the circle. Fold over dough to cover the plum. Press edges of the dough together (crimp) making sure there are no gaps in the dough allowing no plum juice to escape. Bring a large pot of salted water to a boil. With a slotted spoon carefully place the first half of the dumpling in boiling water. Boil gently for 10 minutes. In the meantime melt ½ stick of butter over medium heat and then stir in panko breadcrumbs and sauté until brown. Put aside. When dumplings are done, remove them from the boiling water with a slotted spoon and let them rest on a plate. Be sure there’s no water on the plate. If there is, drain so dumplings don’t soak up water. Repeat with second half of dumplings. When ready to serve, melt the stick of butter in a large flying pan and melt over medium heat. When the butter begins to bubble place the dumplings in pan and brown on both sides. You may have to do this in batches. Reheat breadcrumb mixture. Transfer dumplings to a serving platter and spoon the buttered breadcrumbs over the hot dumplings. * We used regular plums because we couldn’t find the Italian Prune Plums, which Katherine thinks her mom used. Italian Prune Plums are small, dense and egg-shaped. So if you use those plums, your recipe can be adjusted. Most likely you will use ¼ to ½ of the plum for each dumpling. Friuli-Venezia Giulia is located in the northeastern part of Italy. It borders Slovenia (formerly Yugoslavia) to the east, Austria to the north, Veneto to the west and the Adriatic Sea to the south. Historically, ethnically and linguistically diverse, it is an extremely complex region. Some sections were once a part of the Venetian Republic while others were under the rule of the Austria-Hungarian Empire. Udine was in the Friuli part of the region more connected to Venetian influence. Its cuisine is simple, traditional, uncomplicated fare. Trieste, our next destination, is, on the other hand, in the Venezia-Giulia part of the region. 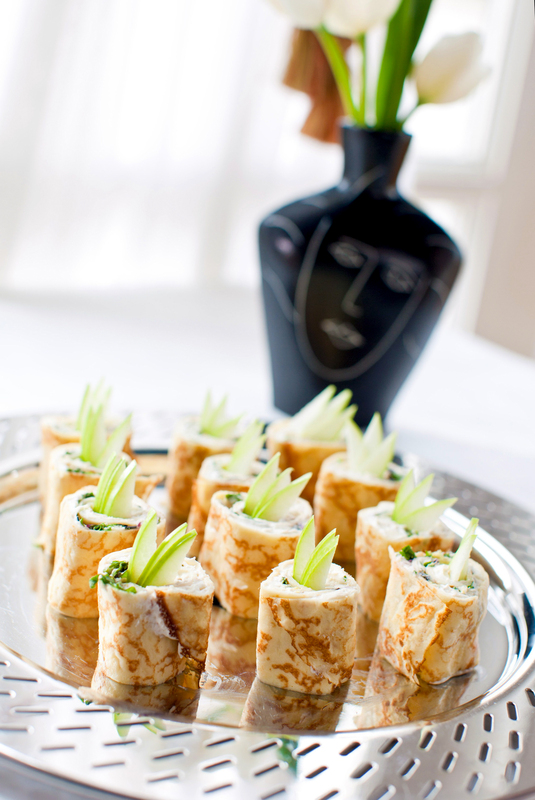 Its cuisine reflects its Central European past embracing the influences of Austria, Hungary, Slovenia and Croatia. From the minute we entered the city I could literally feel Austria. The Viennese architecture of its many handsome buildings surrounding the piazza did not remind me of any other Italian city I had traveled to so far. We checked into the luxurious Hotel Grand Duchi D’Aosta located right on the very impressive Piazza Unita d’Italia. It was late so we would save our exploration of the city for the next day when we were to meet Chiara, one of Paolo’s advertising co-workers and a former Trieste resident who was here to visit her family. This trip to Italy was actually one of the more difficult ones for me to coordinate. For years I would travel to Italy at least two to three times a year and had made it a priority to explore new regions (I eventually visited all twenty of them, most of them many times) and educate myself about authentic Italian cuisine, culture and tradition; but this time I was in the midst of opening the second Convito Italiano location in downtown Chicago which was such an overwhelming undertaking I wondered whether traveling again was the wisest choice. But as I always did, off I went and on this particular night I found myself at dinner discussing the new location with Paolo. Construction was already under way – so most of the overall design plans had already been determined, but the selection of the “finishing touches” remained. I inspected glasses, plates, salt and pepper shakers. I think every plate and glass in every restaurant we dined in during this trip was turned upside down by either Paolo or myself. At one point as he stole a peek at the bottom of a vase overflowing with flowers he looked at me and whispered; “I can’t believe I am doing this! I disgust myself!” I must say, seeing Mr. Motorcycle Man/Mr. Ad Exec getting excited over the search for a particular vinegar cruet or the perfect highball glass was rather funny, but I appreciated his support and reminded him that Italy was after all a country known for its design, so he was just performing his civic duty whether he thought it was the macho thing to do or not. The next morning we met Chiara, his co-worker, for a tour around her native city. She spoke about Trieste’s proud, sometimes sad history, deeply linked to both Central Europe as well as to Italy. She also pointed out the remaining Hapsburg splendor especially evident in all the imposing spectacular buildings located in and around the main piazza. Under the Austrian-Hapsburg Empire, she explained, Trieste had once been a very important center of literature, politics and culture. Today, although that power had diminished, it still remains a center for many things – shipping, shipbuilding and financial services to name a few. And its advantageous position on the Adriatic Sea allows it to continue as an important port although the glory days of being the most important port in one of the most important empires in the world are over. We stopped for a morning coffee at a beautiful Belle Epogue-style pasticceria just off the main piazza. Through its etched glass doors we entered into a bygone era where the intricate designs of “Beautiful Age” artisans had created a fairy-tale-like atmosphere. The café’s rich dark wood walls were carefully carved with elegant swirling floral patterns and the black and white tiled floor had been laid in a complex pattern that was typical of the fine detailing of that era. Chiara purchased a beautiful selection of pastries for Paolo and a lovely little rolled sweet bread called a Presnitz for me. Presnitz is a typical Trieste puffed pastry filled with nuts and dried fruits. It reminded me of strudel. Once again we felt the Austrian influence. We toured a number of historical sites including Colle di San Giusto (the San Giuso hill), located in the oldest part of Trieste and its beautiful Romanesque church as well as Miramare Castle on the Gulf of Trieste built for the Austrian Archduke Ferdinand Maximillian in 1856. But the highlight of the weekend for me was our Sunday lunch at Antica Trattoria Suban, a fantastic restaurant established in 1855. When Chiara made the reservation, she informed the proprietor that Paolo and I owned an Italian restaurant and market in Chicago. When we arrived we were treated like royalty. The owner gave us a tour of the facility – the open kitchen, hearth ovens and the open case of refrigerated meats – all beautiful and inviting. We then sat down to a fabulous meal of Trieste specialties beginning with a slice of grilled ham with grated horseradish and mustard; a bean, ham and sauerkraut soup called Jota; a crepe with radicchio; a crepe with basil and cheese (their specialty); veal shank with a side of heavenly, savory sautéed potatoes, onions and pancetta; and ended with a delicious apple strudel. Before we left the proprietor showed us the very complimentary article about his restaurant in Bon Appetit magazine – all praises very well deserved. This man was so kind. He would not allow us to pay and even gave me a plate with a picture of his restaurant on it. When we protested about paying the bill, he told us if we tried, he would start a war with Washington. We all laughed but made no further attempt to pay. 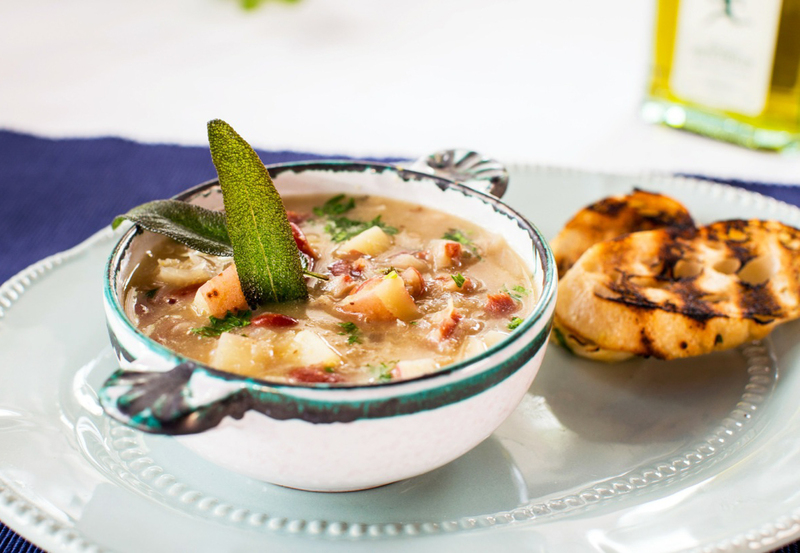 This hearty peasant soup, one of the best-known dishes of Trieste, has many versions. This one is brothier than some. Some remove the meat from the soup. This one leaves it in. In a large stockpot, heat the olive oil over medium heat. Add pancetta and brown until crisp. Add onions, garlic and sauté for approximately 4 minutes. Add stock, sage, bay leaf and cornmeal, whisking the cornmeal into the stock. Add ham hock and simmer for 35 minutes. Remove the ham hock and cut the meat into small pieces. Add back into soup. Add potatoes and cook until tender about 8 minutes. Add the beans and parsley and stir into the soup. Serve hot. I returned to Trieste a second time with my dear friend Leslee Reis, owner of the acclaimed restaurant Café Provencal in Evanston, Illinois. Leslee was also my mentor. She opened her restaurant a few years before I opened Convito in a neighboring suburb. Our friendship, however, was formed years before we began our restaurant careers through various women’s organizations as well as our common circumstances of motherhood, children of similar ages and an intense interest in food. I frequently sought her advice on any number of things and she was always more than accommodating. Leslee and I were perfect traveling companions. We viewed travel and life pretty much the same way – taste it, savor it but don’t crowd it with so many things that you can’t take time to reflect on it. 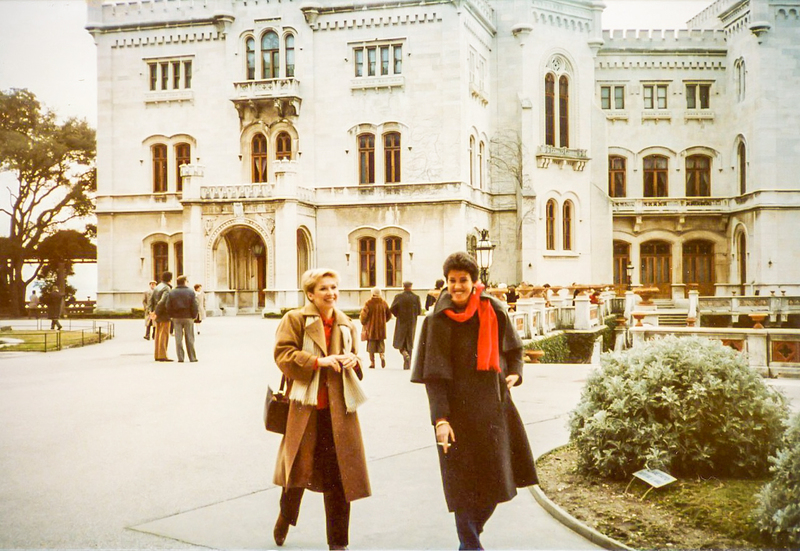 Leslee had one of the sharpest wits around and could make me laugh like no other – so travel with her was not only instructive and reflective but often hilarious. We could also “talk shop”. On this particular trip, we were both reassessing our restaurants – giving them a second look. Both of us had expanded our concepts – Leslee by opening two more casual restaurants and I another Convito in Chicago. Had we made the right decisions? Aware that making change was difficult, we also knew that sometimes that was the best way forward. I felt blessed to be able to talk about these things with someone I knew would completely understand. After much discussion, we concluded “tweaking” was required on both of our parts in all of our restaurants. Freshening things up a bit would be on our agendas when we returned to Chicago. Of course I wanted Leslee to experience the beauty of Trieste so we spent a great deal of time visiting all the sights Paolo and I had visited five years before. She too loved the city. Of course, a dinner at Antica Trattoria Suban was a must. I looked forward to my second experience there but warned her that we had to taste all the restaurant’s specialties. “Be prepared to be stuffed,” I told her “but happily so! “ Neither of us ever had trouble with that concept. Abby Mandel, friend, cookbook author, columnist and founder of the Chicago Green City Market was originally supposed to accompany Leslee and I on this trip. But because of her husband’s illness, she cancelled. We promised to keep a detailed journal of all the food, wine and experiences of the trip so she could still feel a part of our journey in some way. She was correct. It was really special. 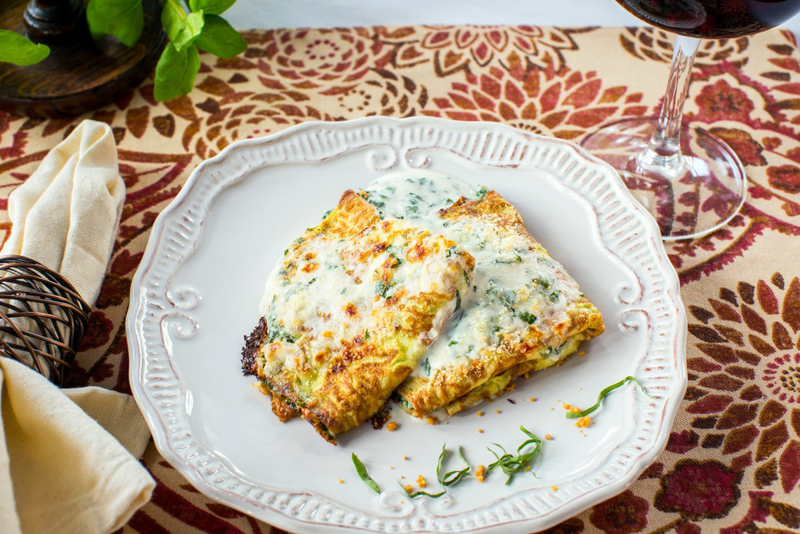 Following is Convito’s version of that basil crespelle based on Leslee’s journal entry. Mix the filling ingredients together. Spread a thin layer onto each crepe (approximately 2 tablespoons each). Fold crepe in half then in half again. In the meantime make the sauce heating the cream over medium heat. Add the cheeses and stir until melted. Add salt and pepper. Stir in the basil and set aside. In a large ovenproof skillet, melt 2 tablespoons butter. Place the six crepe pieces in the skillet. Place in a 500-degree oven for 4 minutes. Place on six individual plates. Spoon the sauce over each. Percoto was our next destination, home of the famous Nonino grappa distillery active in Friuli since 1897. 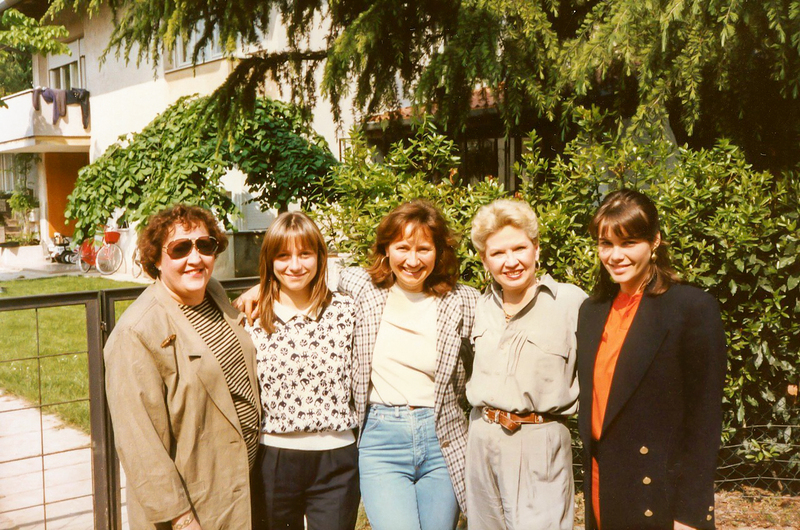 Leslee would describe the Nonino visit as “Our sojourn to Beverly Hills – Friuli”. While the rolling hills of Friuli may not equate to the topography of Beverly Hills, the glamour of the Nonino family did! Benito and Giannola were Friuli’s power couple – he the genius grappa maker (quiet and serious) and she the dynamic power behind the throne (a hurricane of energy and ideas). According to legend Giannola first fell in love with her husband Benito and then fell in love with grappa. Her goal was to enhance and perfect the Nonino brand and bring its acclaim as a first class spirit to the rest of the world. Benito and Giannola and their three gorgeous daughters – Christina, Antonella and Betty all took turns in our grappa education. First Betty, the youngest daughter, took us on a tour of the distillery. Grappa she pointed out is the final production of a grape made from the pomace (skins, seeds and stems) after the fruit has been used to make wine. “Grappa today”, she said proudly, “has acquired a very good reputation because of producers like Nonino – unlike the grappa of old which was harsh and bitter – a spirit whose only use was to starve off a cold, or anything for that matter. We will leave the grappa tasting until dinner tonight”, Betty said. Thank god, Leslee and I thought. Already tired from our long drive, we didn’t want to fall asleep (or pass out) on the floor of the Nonino cellar. And unfortunately, I didn’t have such a good memory of the grappa I had tasted previously. I am not generally a spirits person. But I would give it a second look – certainly here in the grappa center of the universe. The rest of the afternoon was spent with Betty and Benito driving through the lovely hills of Friuli. Both the Colli Orientali del Friuli and Colli Goriziano are known throughout the world for their fine white wines. Convito carries many. We passed many of the vineyards of famous producers –Jerman, Piuatti Mario Felluga, Livio Felluga, Gradnik ending at the vineyard of Benito’s idol, white wine master Mario Schiopetto. It was a thrill to meet Mario Schiopetto. I had long been a fan of his whites – especially Schiopetto Tocai. When one speaks about Mario Schiopetto one speaks about the story of modern Italian enology. 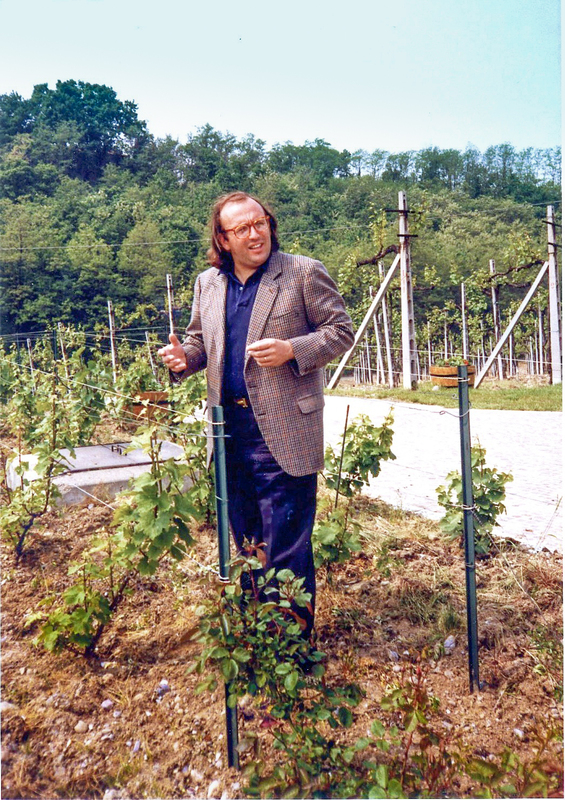 For many years he studied the most prestigious wineries in Europe bringing the best of what he had learned back to Friuli. According to Benito, his contributions to the innovation process and to the improvement in quality in Italian wines are legendary. We actually stopped to have a glass of wine with the master himself – a glass of 1988 Pinot Grigio. Mario and Benito greeted one another warmly and spoke excitedly in Udinese dialect while Leslee and I pinching ourselves – sat quietly gaping at the interesting collection of restaurant plates and tiles that hung on Signor Schiopetto’s kitchen walls. The next Nonino handoff was to Christina, the oldest daughter. She was waiting for us in a converted mill (now a small bar). A huge mortadlla and a Prosciutto di San Danielli sat on the counter filling the room with a sweet somewhat porky smell. Christina whom I had met in Chicago a year ago, insisted we taste the prosciutto, a product of nearby San Danielle, before we left for a tour of the Roman ruins in Aquileia, a small town on the Adriatic. San Daniele is one of Italy’s two famous prosciuttos – the other is Prosciutto di Parma. San Daniele is sweet and aromatic and best served with simple wines. Parma is savory and has a wider range of uses. Both are excellent. I like to serve prosciutto in the summer draped over fresh fruit. 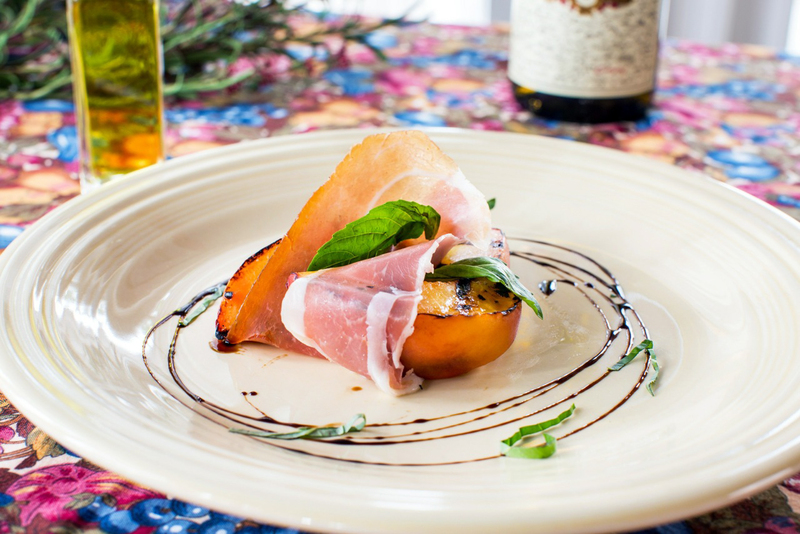 Although the classic combination is prosciutto and melon, my favorite pairing is prosciutto and peaches when peaches are at the very height of their sweetness. We said goodbye to Betty and Benito, drove to the Roman ruins and then back to our hotel to ready ourselves for dinner. Matriarch Giannola orchestrated dinner that evening. The cast of characters changed somewhat. Benito and Betty stayed home. “He doesn’t like evening activities”, said Giannola. Middle daughter Antonella joined us accompanied by her attractive fiancé, as did Christina with her husband, a cross between an Italian-style hunk and a somewhat preppy Princeton grad. Then there was the smooth talking, quick moving TV man. We weren’t sure how he fit in. Later we learned that he was the “Italian Dan Rather” visiting the Noninos to do a program on grappa and the Nonino family the next morning. An old Chinese Proverb states that Taking a Second Look Costs You Nothing and it wasn’t until late in life that I finally made peace with that sentiment. This day it paid off. The nose of this Nonino grappa arrested me with its floral honeycomb aroma and its apple and ripe quince notes; a much softer and alluring welcome than I expected. Upon drinking it, the taste was surprisingly elegant and smooth. I was impressed! This was unlike any grappa I had ever tasted and although I might not cap off each and every night with a glass of this complex liqueur, I certainly would recommend it to anyone interested in a divine after dinner drink. To this day, on those infrequent evenings when I’m moved (or convinced!) to order a grappa after dinner, it is always a Nonino (and hopefully Nonino Picolit). Morning arrived. It was time to leave Percoto and continue our journey to Milan. We stopped by the distillery to say goodbye. The driveway was filled with a number of vans and TV paraphernalia. Clearly they must be readying for the Nonino TV program. We thanked Benito, Giannola, Antonella and Betty (Christina was home with sick kids) for a fabulous visit. As we were about to leave, Mr. Italian-Dan- Rather rushed over and placed a glass of grappa in our hands. “Please”, he said to Leslee and I, “we would like you to do some “tasting-room-play-acting” for the program’s intro. You don’t need to say a thing, just drink the grappa”, he directed. What could we do but acquiesce?! What a fitting conclusion to our Friuli-meets–Beverly Hill sojourn – Leslee and I in the early morning hours with a glass of grappa in hand trying to look calm and sophisticated like this was an everyday occurrence. I’m certain we looked just the opposite. As the cameras began to roll, Leslee learned over and whispered in my ear, “Are you ready for your close up?” Her hearty laugh rumbled through the room and turned the heads of the entire Italian TV crew! What a lady! So much for life at the Nonino Grappa Distillery. As we said our final goodbyes Giannola – who had earlier promised to do a grappa tasting in Chicago for Les Dames d’Escoffier during their next visit – said in her enthusiastic, energetic voice – “Ciao. A Presto! (See you soon) and added “Vive le Donne!! (Long Live the Women) No words were more truly spoken. These Nonino women were amazing!